Elizabeth Public Schools & Prevention links present on important topic for our community members. 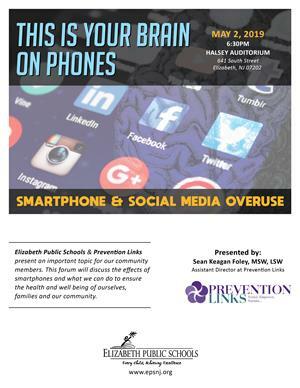 This forum will discuss the effects of smortphones and what we con do to ensure the health and well being of ourselves/ families and our community. 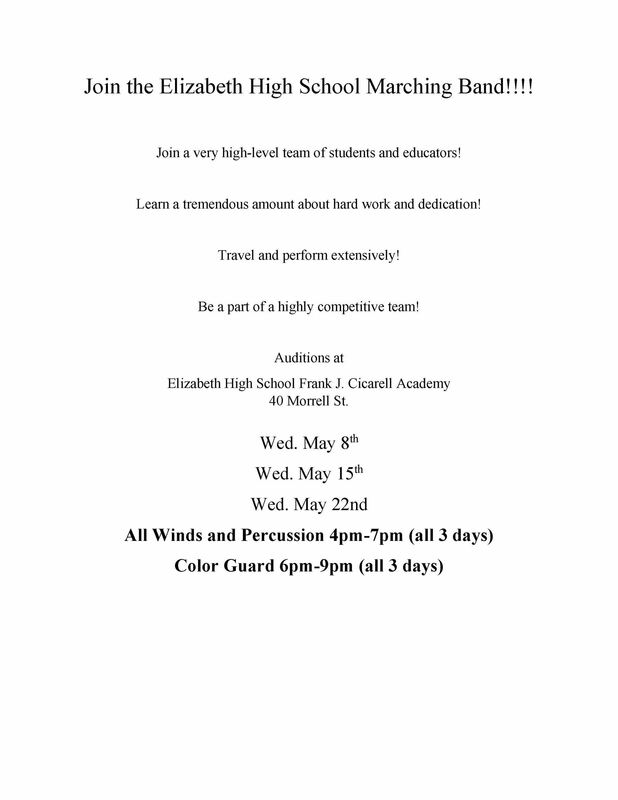 Join the Elizabeth High School Marching Band!!!! 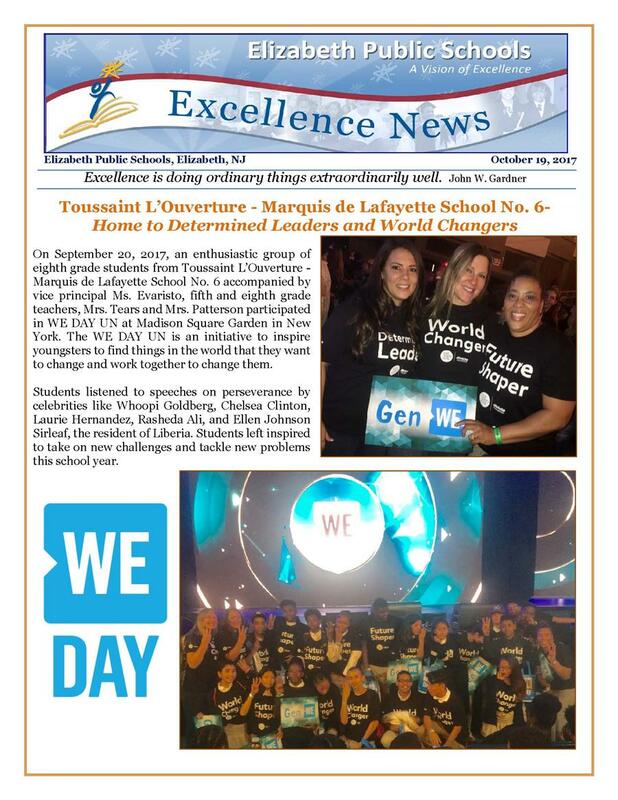 Join a very high-level team of students and educators! Learn a tremendous amount about hard work and dedication! Travel and perform extensively! Be a part of a highly competitive team! 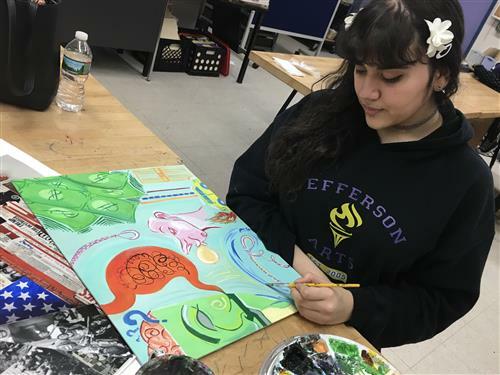 Thomas Jefferson Arts Academy junior Sophia Pineiro-Widejko was selected to receive the Silver Key recognition for the 2019 Scholastic Art and Writing Awards. 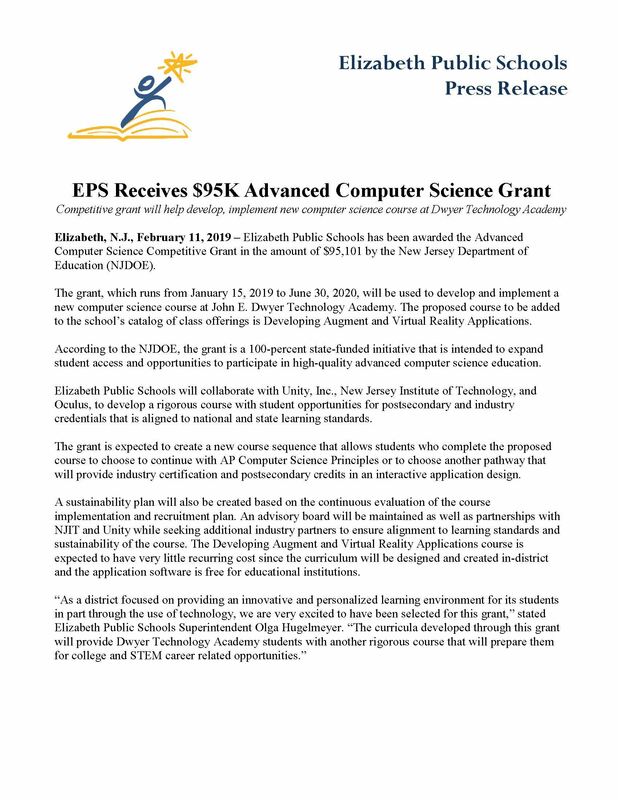 Elizabeth Public Schools has been awarded the Advanced Computer Science Competitive Grant in the amount of $95,101 by the New Jersey Department of Education (NJDOE). 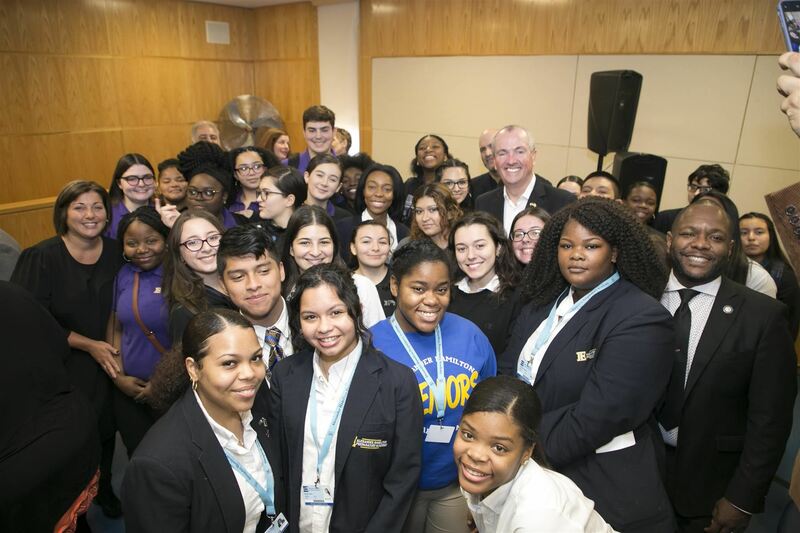 High School students from several of Elizabeth Public Schools’ seven secondary education academies participated in the democratic process by actively campaigning to include teens in the $15 minimum wage legislation that Governor Phil Murphy signed into law in Elizabeth on Monday. 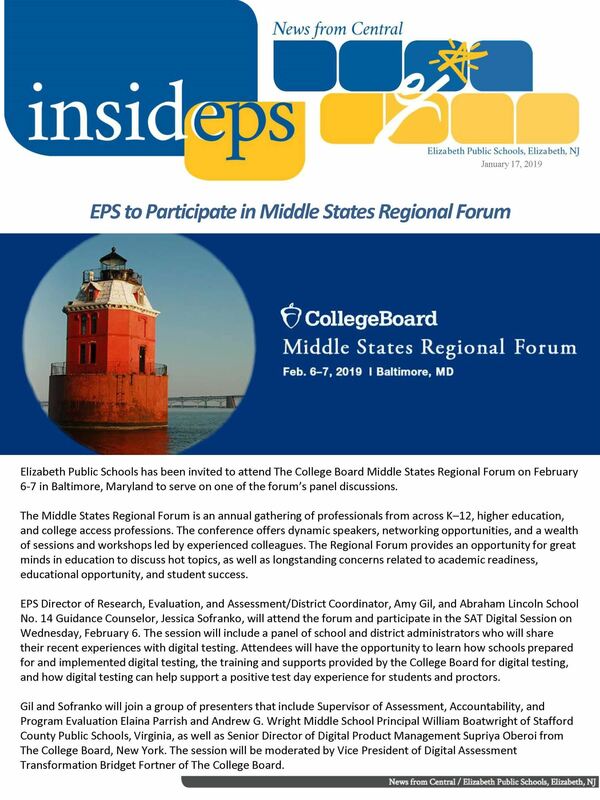 Elizabeth, N.J., February 5, 2019 – Jerome Dunn Academy of Mathematics, Technology, and the Arts School No. 9, Dr. Albert Einstein Academy School No. 29, and Frances C. Smith Early Childhood Center School No. 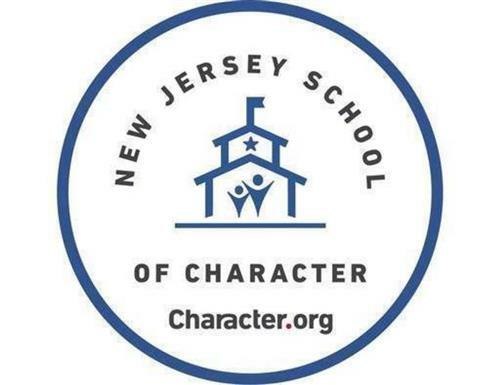 50 were among 26 schools to be recognized as a 2019 New Jersey School of Character (NJSOC) by the New Jersey Alliance for Social, Emotional and Character Development (NJASECD). Elmora School No. 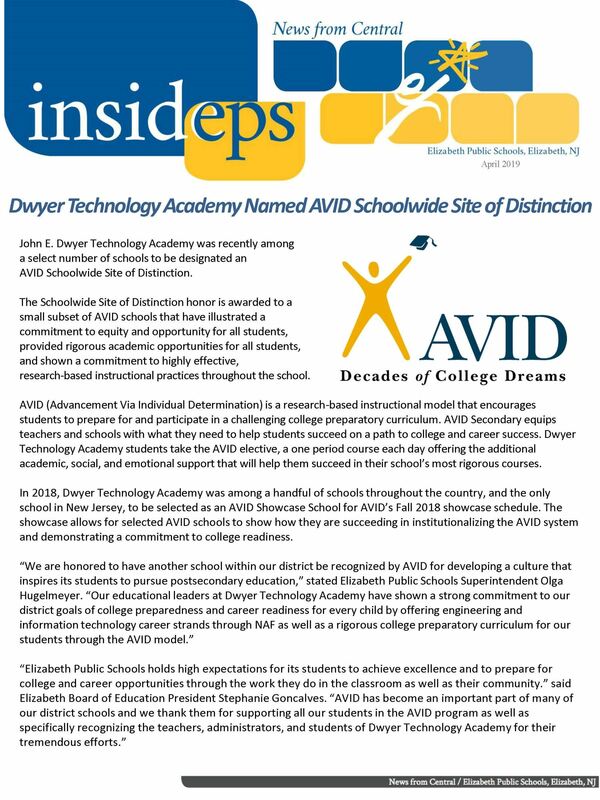 12 has been selected as an Advancement Via Individual Determination (AVID) National Demonstration School in an announcement made by AVID this afternoon. 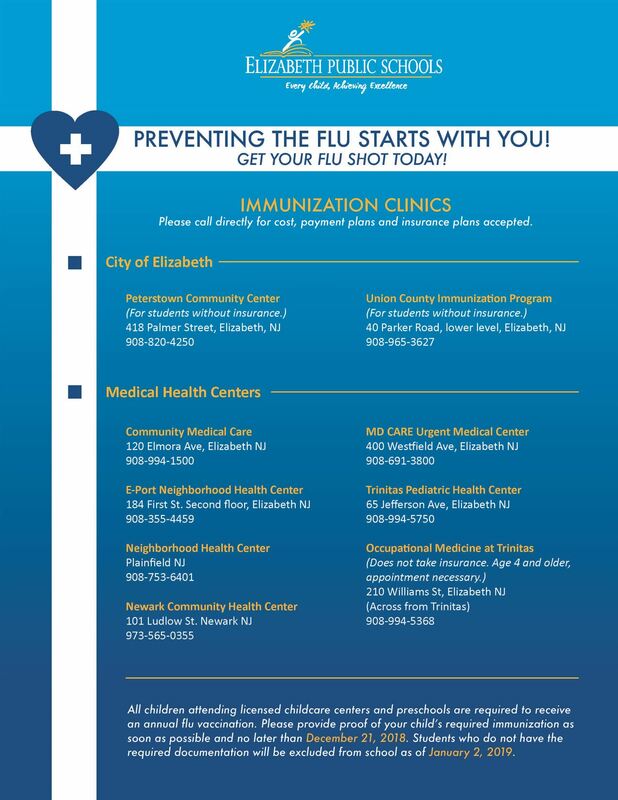 PREVENTING THE FLU STARTS WITH YOU! GET YOUR FLU SHOT TODAY! 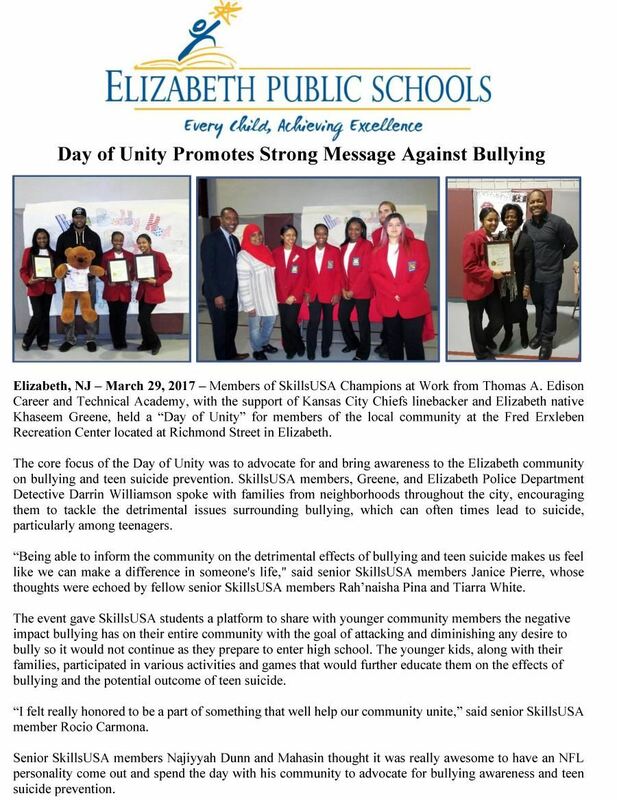 High School students from Elizabeth Public Schools’ seven secondary academies had the opportunity to attend a press conference held by Gov. Phil Murphy and members of his cabinet at the Elizabeth Public Library on Monday that focused on the Affordable Healthcare Act and enrolling in health coverage. 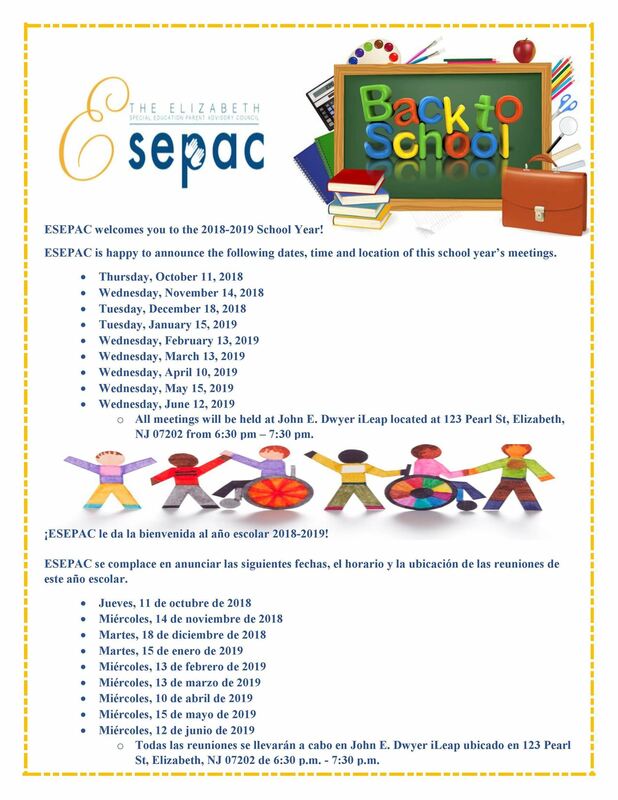 ESEPAC welcomes you to the 2018-2019 School Year! 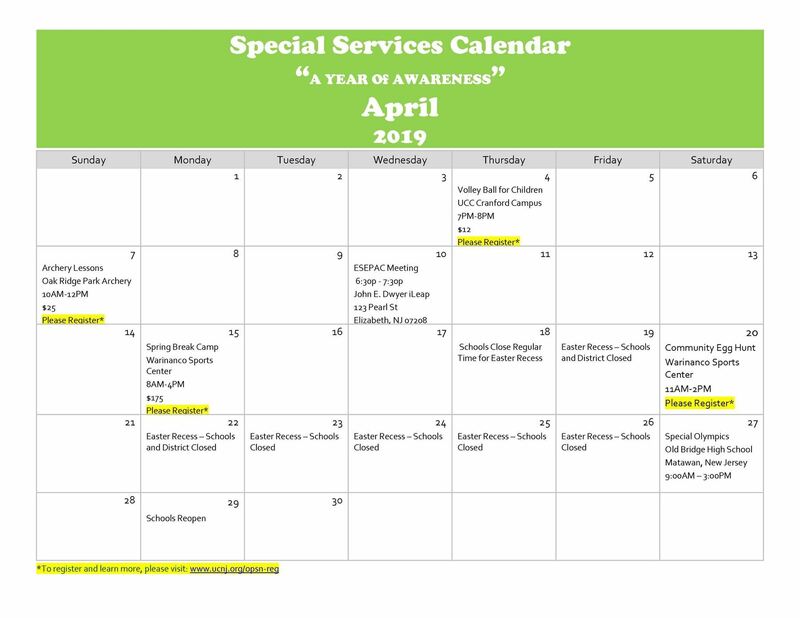 ESEPAC is happy to announce the following dates, time and location of this school year’s meetings. Interim Executive County Superintendent of Union County Daryl Palmieri visited Elizabeth Public Schools as the district welcomed back its students for the start of the 2018-2019 school year. 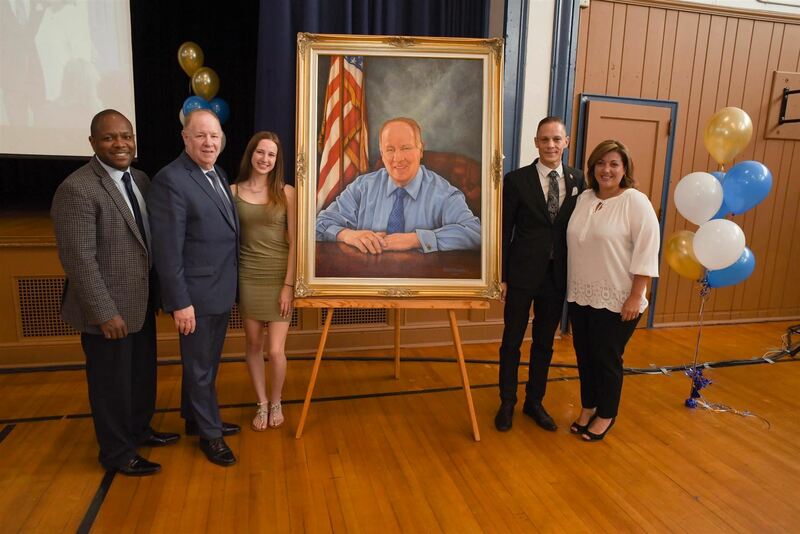 J. Christian Bollwage Finance Academy hosted the portrait unveiling ceremony for City of Elizabeth Mayor J. Christian Bollwage on June 15. 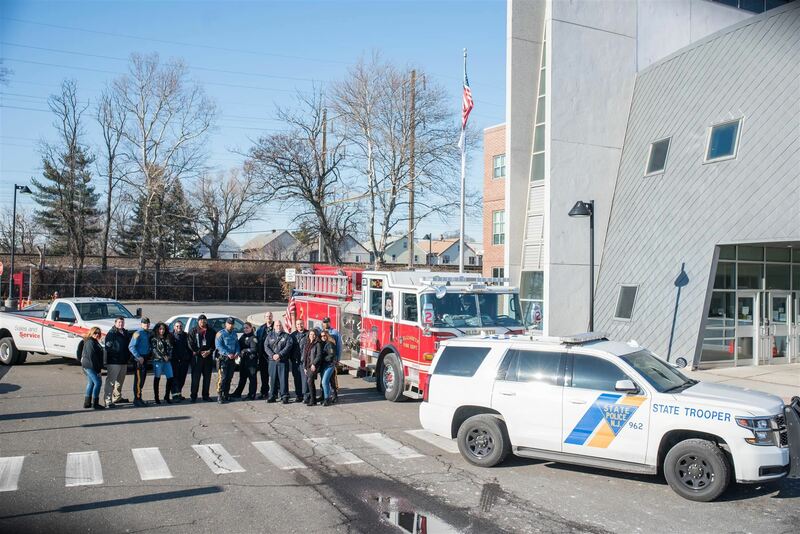 Approximately 2,000 students from throughout Elizabeth Public Schools attended morning and afternoon Law Enforcement Against Drugs (L.E.A.D.) Class of 2018 graduation ceremonies at the Thomas G. Dunn Sports Center. Among the speakers at the graduation ceremonies were L.E.A.D. 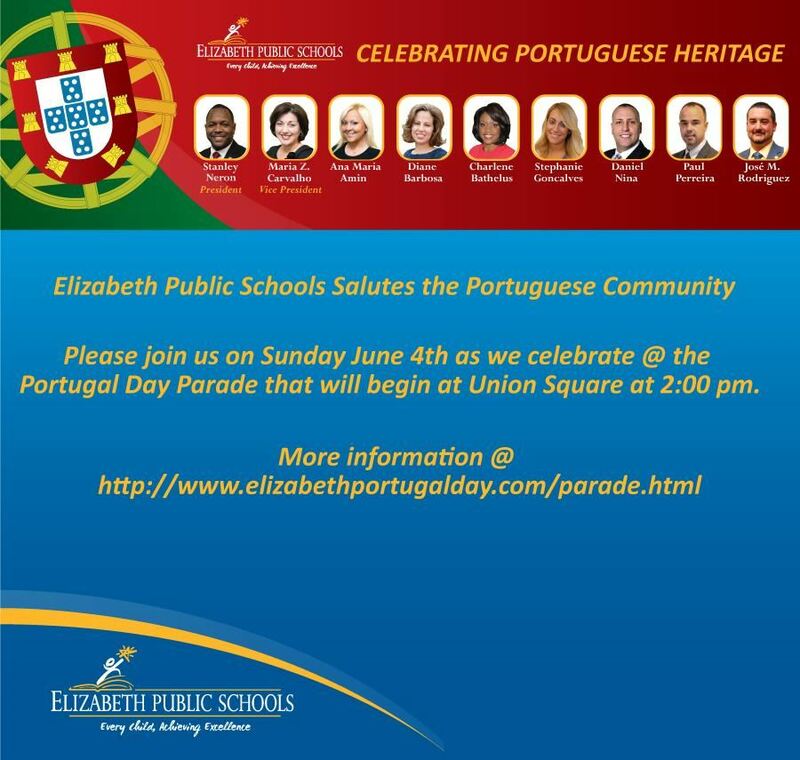 officers Richard Hurler, Jennifer Perez, and Ina Silva of the Elizabeth Police Department; Elizabeth Board of Education President Maria Carvalho and Board member Stanley Neron; and Elizabeth Public Schools Superintendent Olga Hugelmeyer. On June 8, Elizabeth Public Schools held its eleventh annual Healthy Leap into Summer health expo in collaboration with organizers Gateway Regional Chamber of Commerce President, James R. Coyle and Trinitas Regional Medical Center Chief Clinical Officer and Vice President of Clinical Operations and Physician Services, Nancy DiLiegro, PhD, FACHE. The health expo took place in the Dunn Sports Center at 151 Pearl Street, in Elizabeth. At the special Elizabeth Board of Education meeting held on June 4, 2018 at Dr. Antonia Pantoja School No. 27, the Board honored the 2017-2018 Governor’s Award recipients, including the teacher of the year and the educational service provider of the year from each district school. 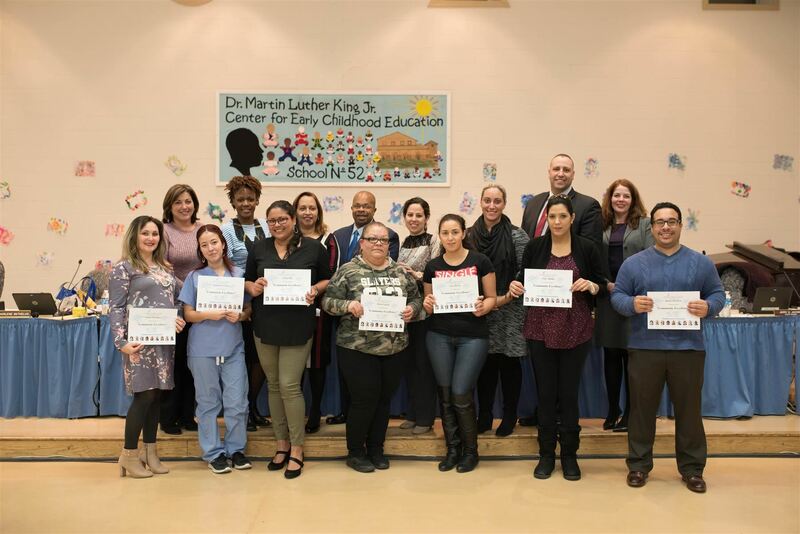 Seventy-two teachers and educational service providers were recognized for their excellent contributions to their respective school communities. Elizabeth City Councilman-At-Large Manny Grova, Jr. and Elizabeth Board of Education President Maria Carvalho partnered to bring the Promiseland Global Kids “Adopt-A-Program to Read” campaign to Elizabeth and presented 308 PGK Dental Hygiene Audio Smart-Kits to prekindergarten students at Dr. Martin Luther King, Jr. School No. 52 in an effort to raise dental health awareness. 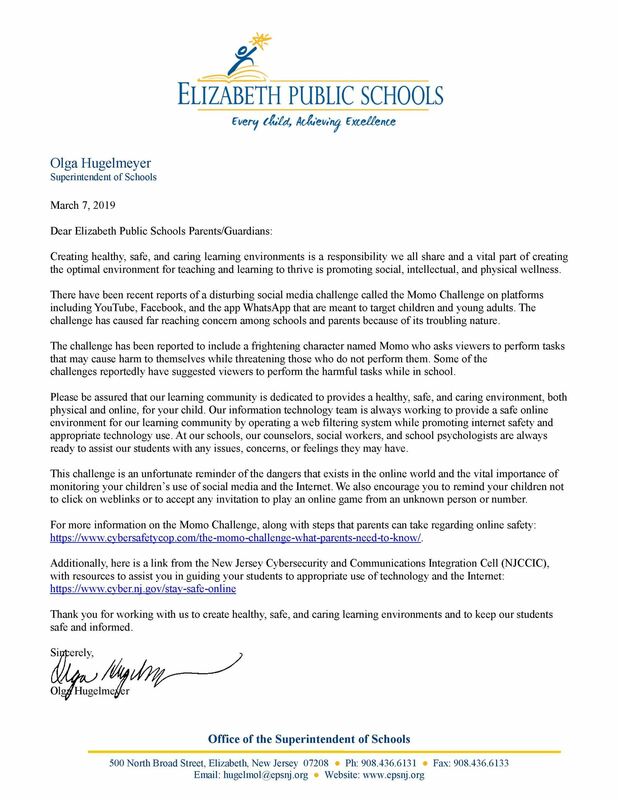 On behalf of the Elizabeth Public Schools Language Arts and Mathematics Departments, we would like to thank all of the educators, parents, and especially students for participating in our cross-curricular initiative for the 100th Day of School. 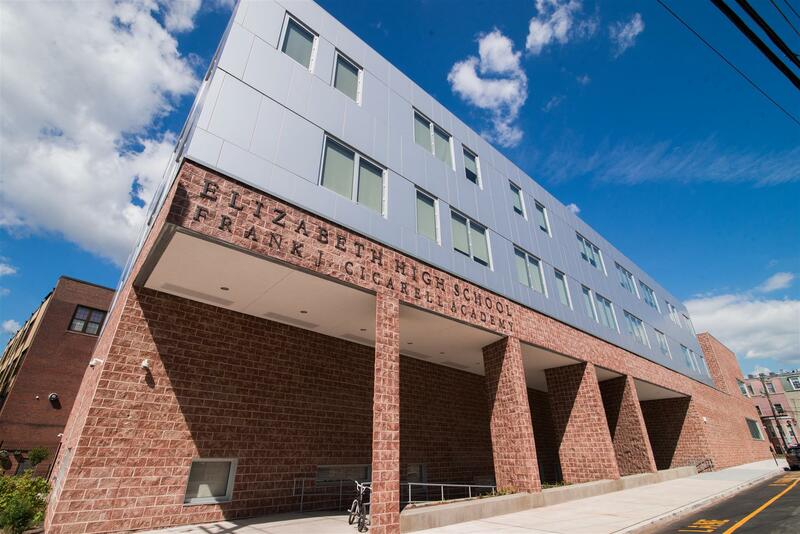 Elizabeth High School (EHS) and Alexander Hamilton Preparatory Academy ranked among the top high schools from throughout the United States as part of the 2018 U.S. News & World Report Best High Schools rankings. 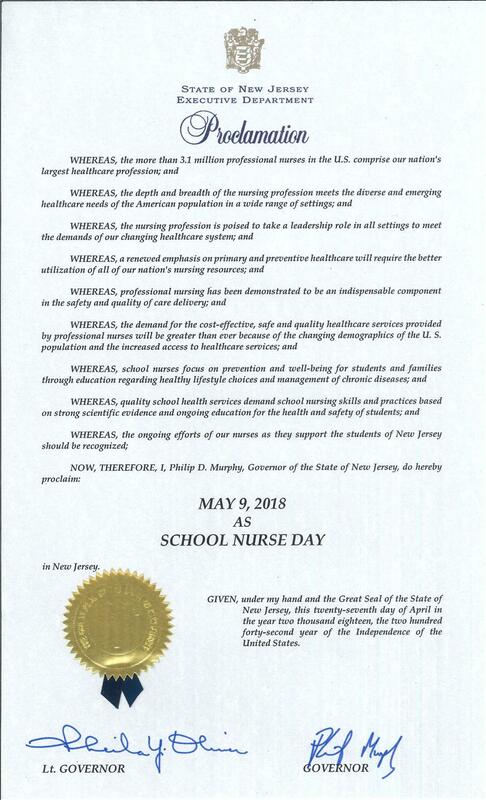 Elizabeth Public Schools and the Elizabeth Board of Education salute our school nurses today on National School Nurses Day for their commitment to the health and safety of our students. Students from the Elizabeth Public School in grades 8-12 recently completed a beautification project on Elizabeth Avenue, painting decorative murals on Traffic Utility Boxes at seven locations throughout the district. On Apr. 25th, the EHS symphonic Band placed 1st out of nine bands at the JP Stevens concert band festival in Edison NJ. Environmental Day was held on April 27 at the Peterstown Community Center sponsored through the generosity and commitment of Future City Inc. 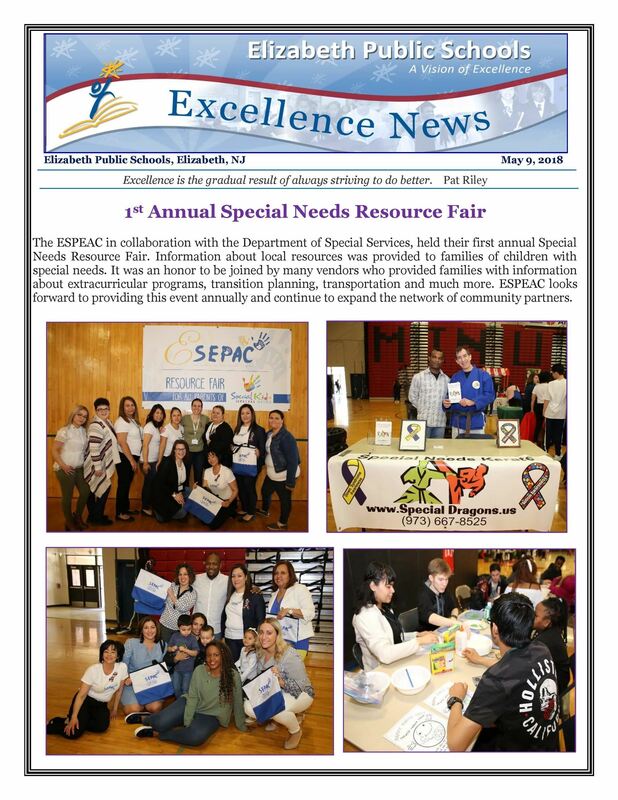 The ESPEAC in collaboration with the Department of Special Services, held their first annual Special Needs Resource Fair. 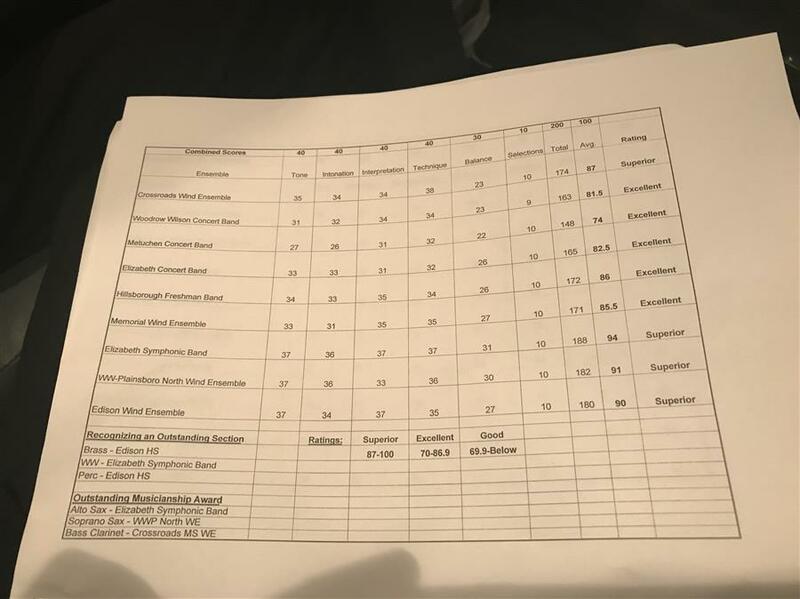 At the Elizabeth Board of Education meeting of March 15 J. Christian Bollwage Finance Academy, the meeting opened with the William F. Halloran School No. 22 Jazz Band performing “Manteca” by Dizzy Gillespie and “Jive Samba” by Nat Adderley followed by a soft shoe Feis dance performed by Victor Mravlag School No. 21 first grade student Lucy Sneddon to “Siamsa” by Ronan Hardiman. 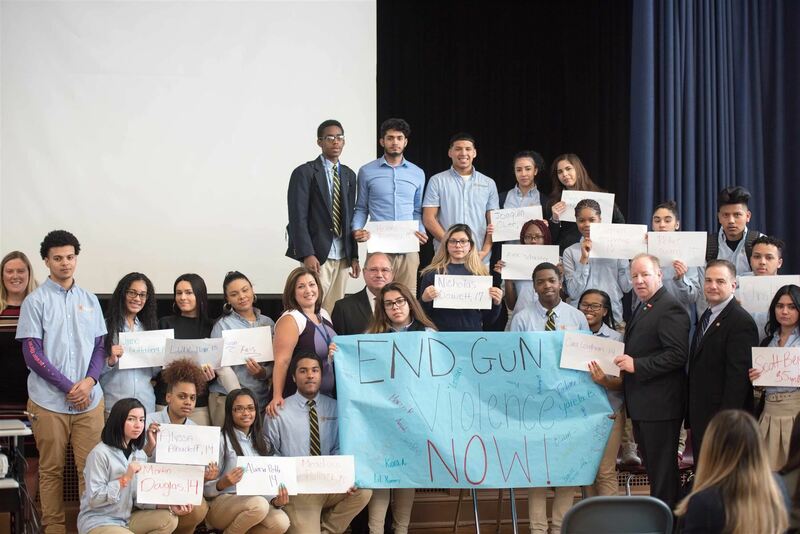 Nearly 6,000 students from the Elizabeth School District’s high schools raised their voices and concerns about gun violence to federal, state, county and local officials at town halls held at each of Elizabeth’s schools today. The Elizabeth Board of Education, in collaboration with New Jersey Assemblywoman Annette Quijano, Union County Board of Chosen Freeholders Chairman Sergio Granados, City of Elizabeth Mayor J. Christian Bollwage, City of Elizabeth Councilman Nelson Gonzalez, and Elizabeth Public Schools Superintendent Olga Hugelmeyer, hosted a resource fair to assist Puerto Rican families displaced by Hurricane Maria. 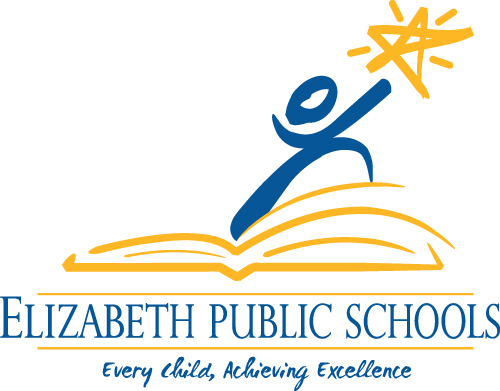 At the Elizabeth Board of Education meeting of February 22 at John Marshall School No. 20, the Board observed a moment of silence for Daniela Genaro, a student of Nicholas S. La Corte – Peterstown School No. 3 who passed away on February 17, as well as the victims and families of the tragic events that took place at Marjory Stoneman Douglas High School in Parkland, Florida on February 14. 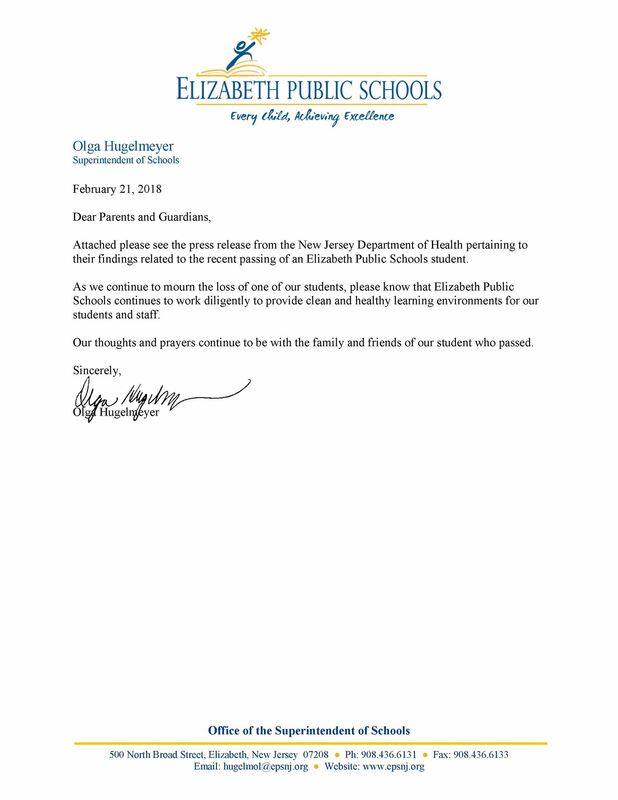 Attached please see the press release from the New Jersey Department of Health pertaining to their findings related to the recent passing of an Elizabeth Public Schools student. 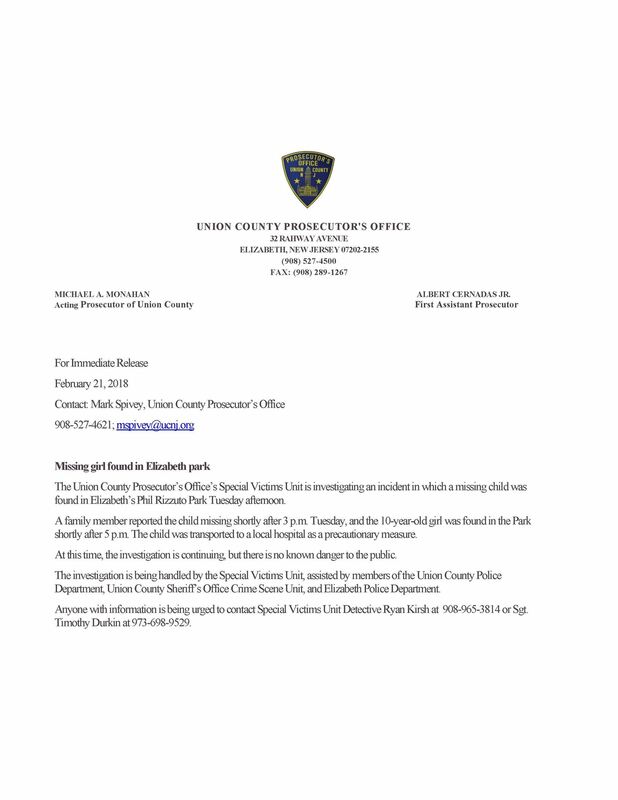 The school district was contacted by the Union County Prosecutor’s Office with regard to a family member reporting a missing child shortly after 3:00 p.m. on Tuesday, February 20th. 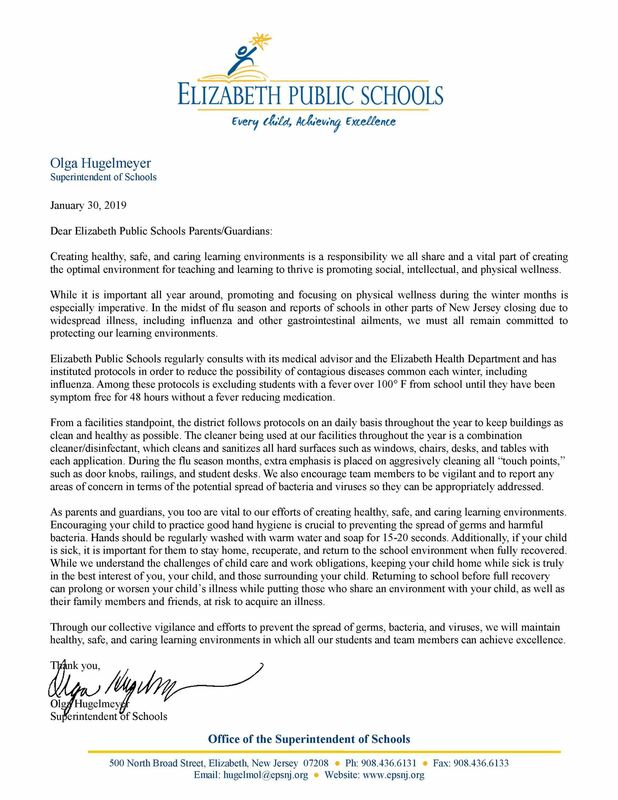 One of the main priorities of the Elizabeth Public Schools is the safety and health of our students, team members and entire community. Winfield Scott School No. 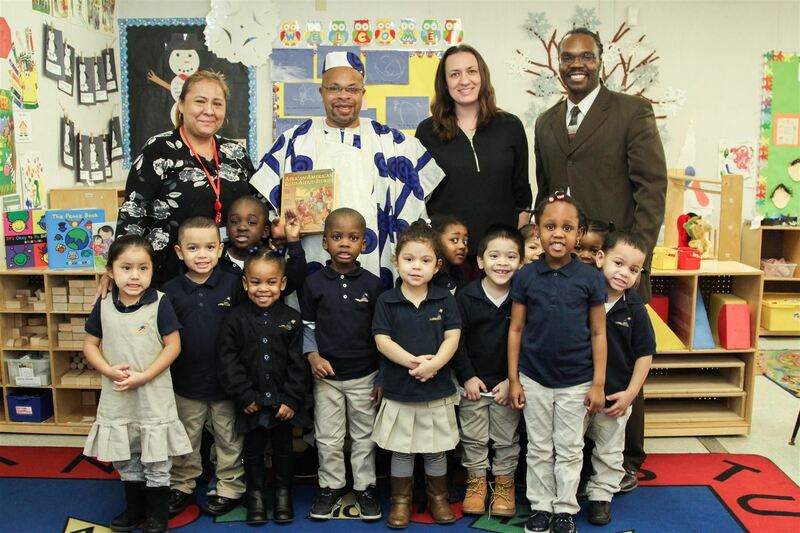 2 had the honor of having our newly elected board member Jerry Jacobs read to our PreK children as we celebrate the contribution of African-Americans during the month of February in recognition of Black History Month. Our hearts are heavy with the unimaginable tragedy that transpired at Marjory Stoneman Douglas High School in Parkland, Florida. We will never be able to make sense of this senseless loss of life. 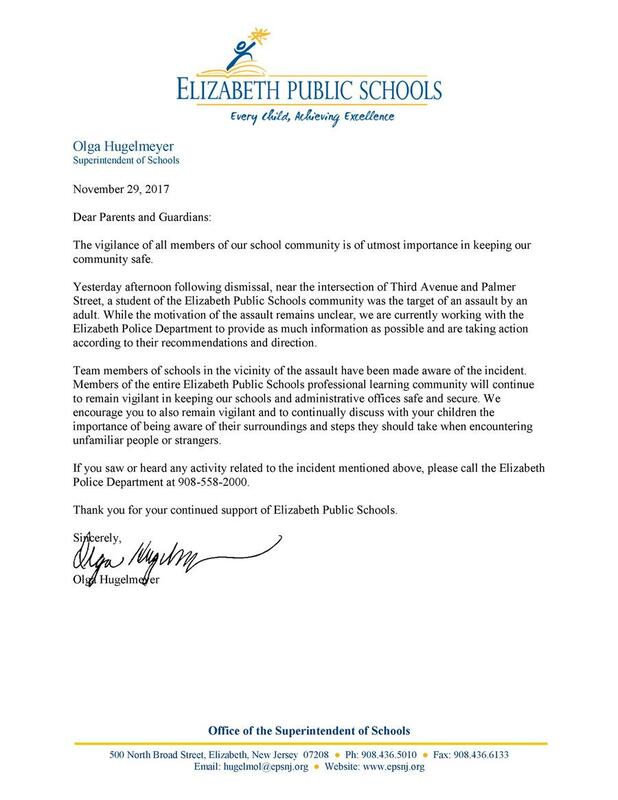 Elizabeth Public Schools would like to convey our profound sympathy and prayers to the children, families, and school staff of Broward County Public Schools in Florida. Elizabeth Public Schools hosted the 24th Annual Hoops To End Homelessness at the Dunn Sports Center on February 3. The charity event is designed to support the Elizabeth Coalition, a non-profit organization whose mission is to serve the needs of the homeless and near homeless by empowering people with tools and support to transition to safe, affordable, permanent housing so that they can live healthy, productive lives. 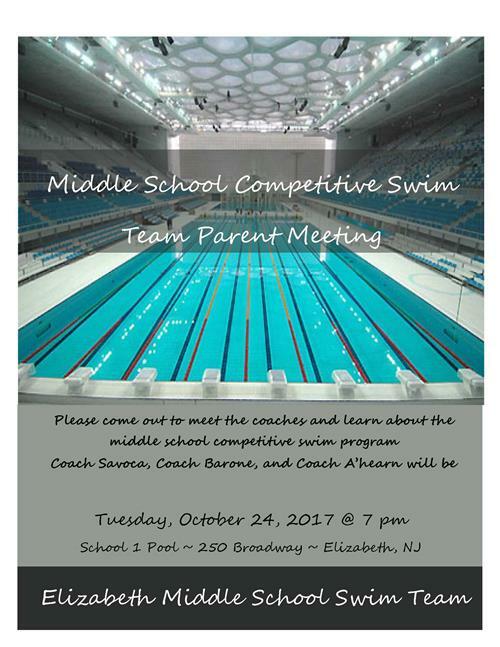 In addition to the senior swimmers being honored for their dedication to their sport and their teammates, the meet was highlighted by record breaking performances in the 200 Yard Medley Relay by both the boys and girls teams. On November 17, 2017, the Hispanic Heritage Committee at Terence C. Reilly and the sixth grade Multicultural RLS class, hosted a "Special Person and Me" Dance to raise money for Hurricane Maria relief. On Saturday, January 27, the Elizabeth Lady Minutemen Girls’ Basketball Program hosted its Annual Pink Out at FJCA. The day was a trifecta: our Freshmen defeated North 13th Street while the Varsity and JV defeated Benedictine Academy. 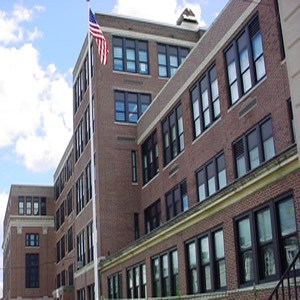 Terence C. Reilly School No. 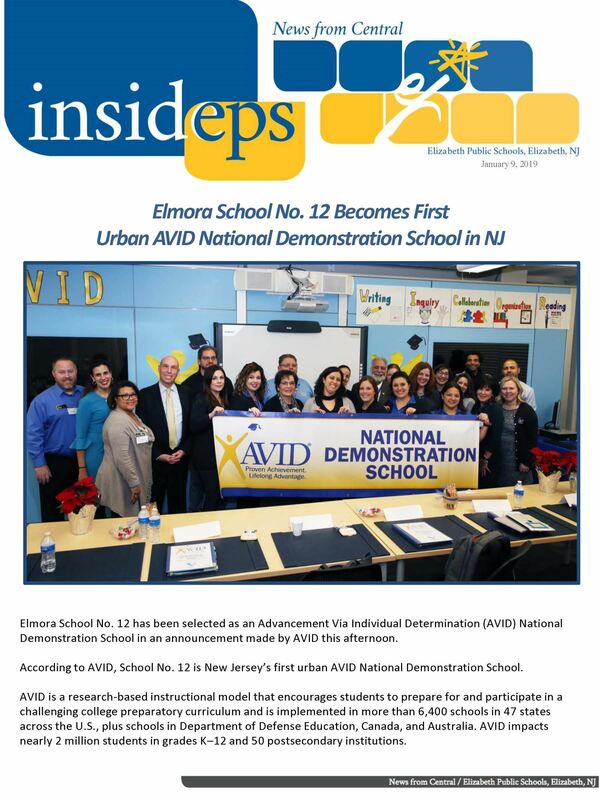 7 ranked among the top 25 schools in the state according to New Jersey Department of Education data obtained by New Jersey Advanced Media. These ratings mark the first time the state has scored each of its public schools on a scale of 1-100. The ratings take into account standardized test results, chronic absenteeism, ELA and Math growth, and graduation rates for high schools. 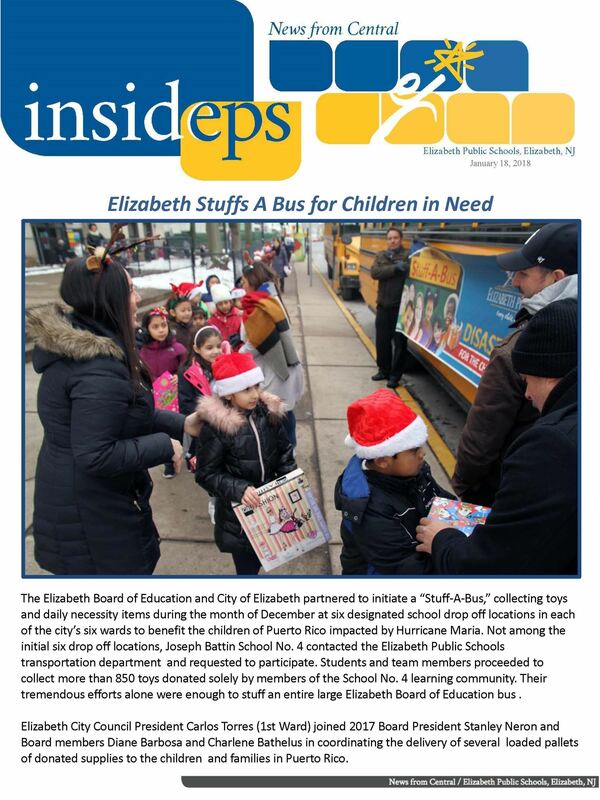 New Jersey State Troopers distributed approximately 560 coats to students of the Elizabeth Public Schools, during their 7th Annual Coat Drive on January 18th and 19th. Students through out our district created thank you cards for our brave men and women in the military. 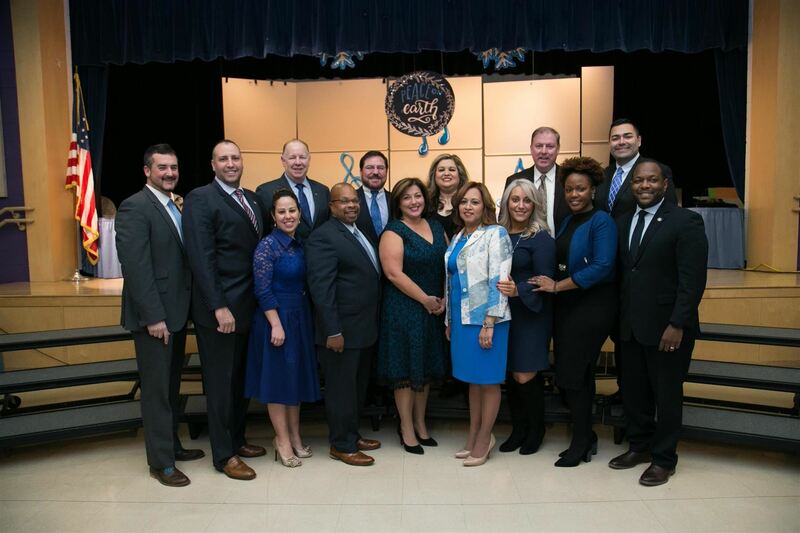 The Elizabeth Board of Education held a swearing-in ceremony on Wednesday, January 3 for its three newly elected members at the Board Reorganization meeting at Juan Pablo Duarte – José Julián Martí School No. 28. Congratulations goes out to former EHS Football player, Max Michel (2017 grad), on officially signing his letter of intent today. 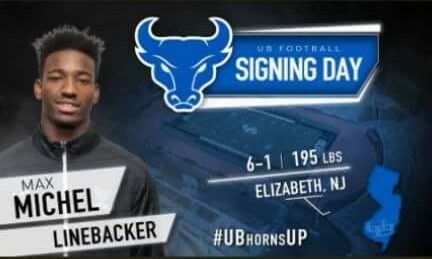 He will be attending University of Buffalo on a full scholarship. 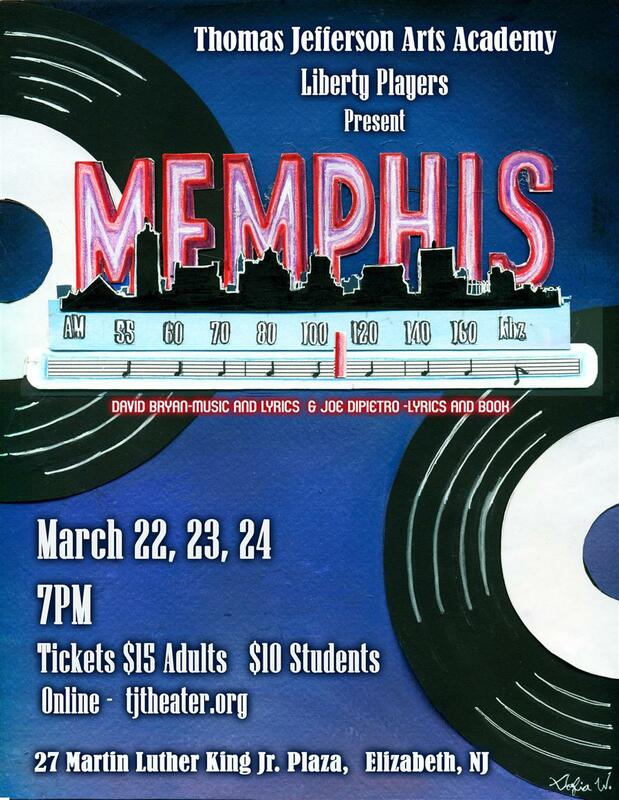 On January 20th the John Marshall School No. 20 community received a visit from Santa Claus. Board member, Jose Rodriguez, and Retro Fitness worked together to bring presents for over 125 students. 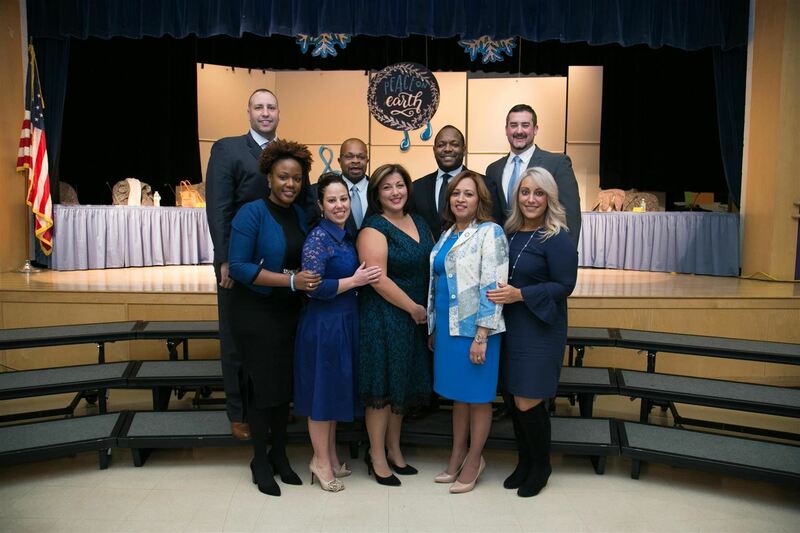 On Saturday, December 16th Moving New Jersey Forward Foundation co-hosted their Annual Holiday Luncheon at School 28 in Elizabeth with Union County Freeholder Sergio Granados & Elizabeth Board of Education Member Maria Carvalho. Elizabeth Public Schools formally dedicated its Academy of Finance on Monday, December 18 in honor of longtime City of Elizabeth Mayor J. Christian Bollwage. 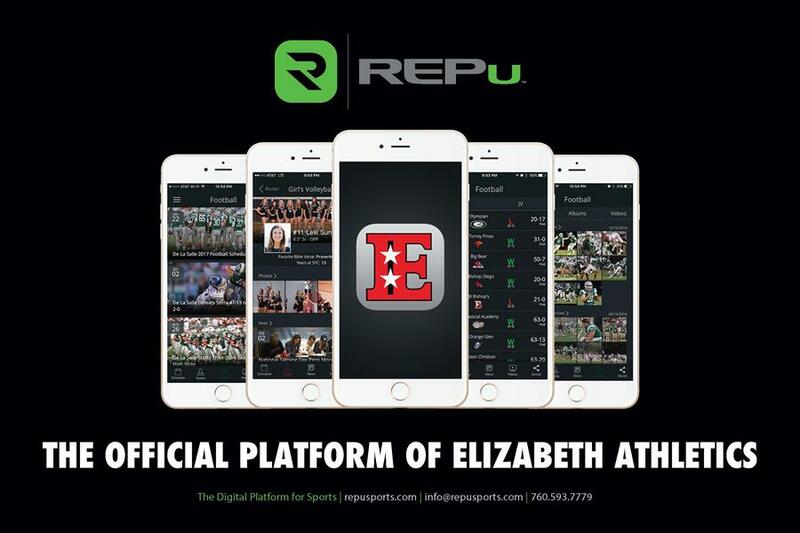 The app is a mobile-first platform focused on elevating Elizabeth’s athletics & activities while providing an all-in-one digital platform enabling us to easily deliver content to our community & fans. Please download the EHS sports app from the apple store and the google play store to follow all athletic events and updates! Victor Mravlag’s PTA hosted a Winter Wonderland on December 5th to kick off the Christmas and Hanukkah holiday season. Winfield Scott School No 2 has a school-wide assembly every month to celebrate our Students of the Month. Our Elizabeth Board of Education President, Stan Neron, spoke to our students about the importance of their education, the decisions they make and offered words of encouragement. The March Of The Wooden Soldiers came to Elizabeth Avenue for the Elizabeth Avenue Partnership’s (EAP) Annual Tree Lighting Ceremony at Union Square Plaza on Tuesday, November 28. Located on Elizabeth Avenue between First Avenue and High Street, the “Square” as it is known was adorned with 15 wooden toy soldiers, created by the Thomas A. Edison Career and Technical Academy Wood Shop and painted by art classes in 15 district schools. Elizabeth City Council President Carlos Torres (1st Ward) donated and delivered 60 turkeys to families in need within the Elizabeth Public Schools. 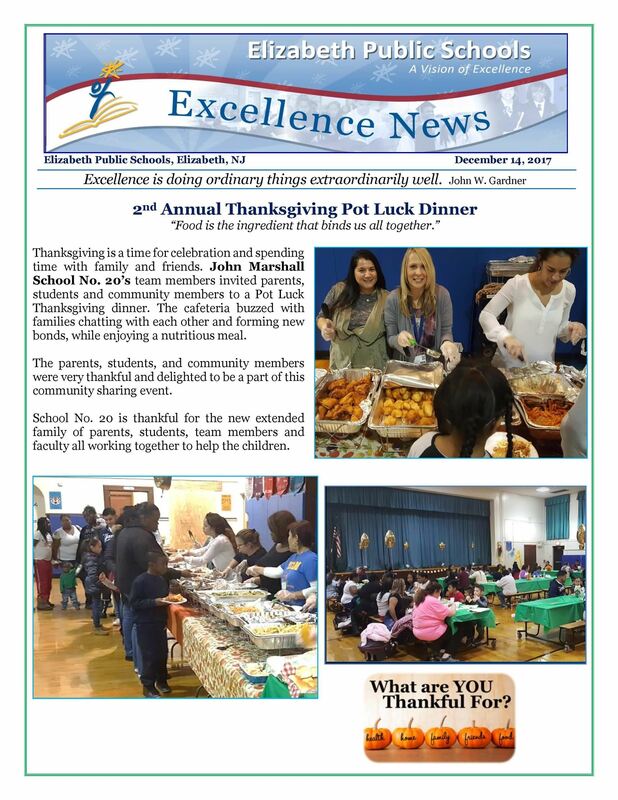 The annual Elizabeth Public Schools Senior Seminar event was held on October 21, 2017 at John E. Dwyer Academy which was open to all 12th grade students in the district. 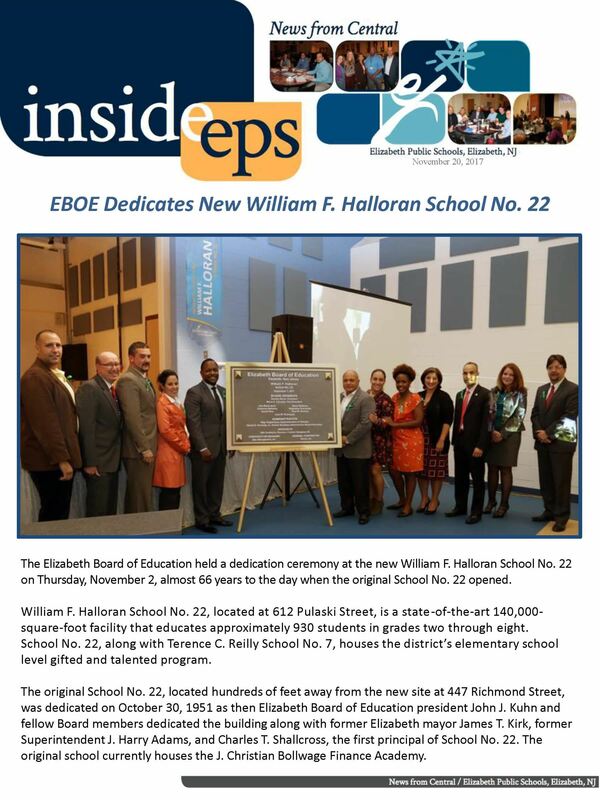 The formal dedication ceremony of the new William F. Halloran School No. 22 building on November 2, 2017 marks the latest exceptional achievement in the storied legacy of School No. 22. New Jersey Senator Raymond Lesniak and Assemblywoman Annette Quijano, as well as members of the New Jersey Schools Development Authority (SDA), construction manager Epic Management, Inc., general contractor Torcon, Inc., and Elizabeth City Council, joined the Elizabeth Board of Education, central administration, and the School No. 22 family in formally opening the new school. 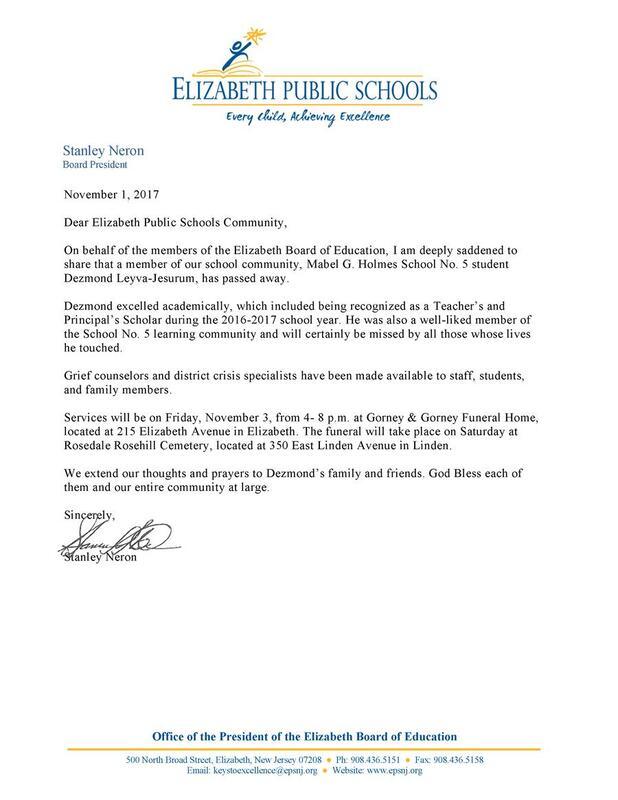 On behalf of the members of the Elizabeth Board of Education, I am deeply saddened to share that a member of our school community, Mabel G. Holmes School No. 5 student Dezmond Leyva-Jesurum, has passed away. New Jersey Department of Education Commissioner Kimberley Harrington visited Winfield Scott School No. 2 on Friday to observe instruction in prekindergarten classrooms that have been supported by the Children’s Literacy Initiative (CLI). 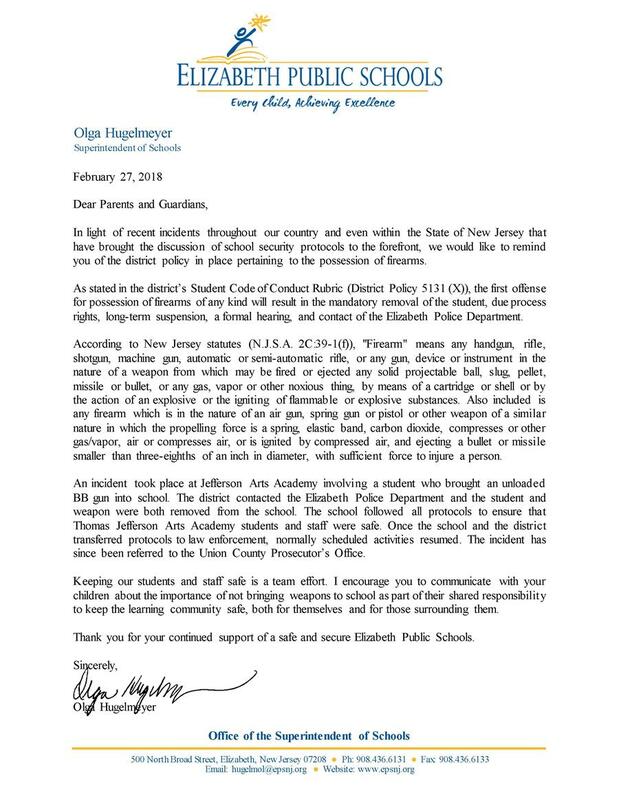 This is a message from Olga Hugelmeyer Superintendent of Schools I am saddened to inform our school community that an 11-year-old student at Mabel G. Holmes School No. 5 died Friday evening. Grief counselors and district crisis specialists will be available to staff and students beginning Monday morning. Our hearts are heavy as we grieve for one of our own. Further information will be furnished when and if appropriate. At the Elizabeth Board of Education meeting of October 19 at George Washington Academy of Science & Engineering School No. 1, the School No. 1 Choir performed “America the Beautiful” by Samuel A. 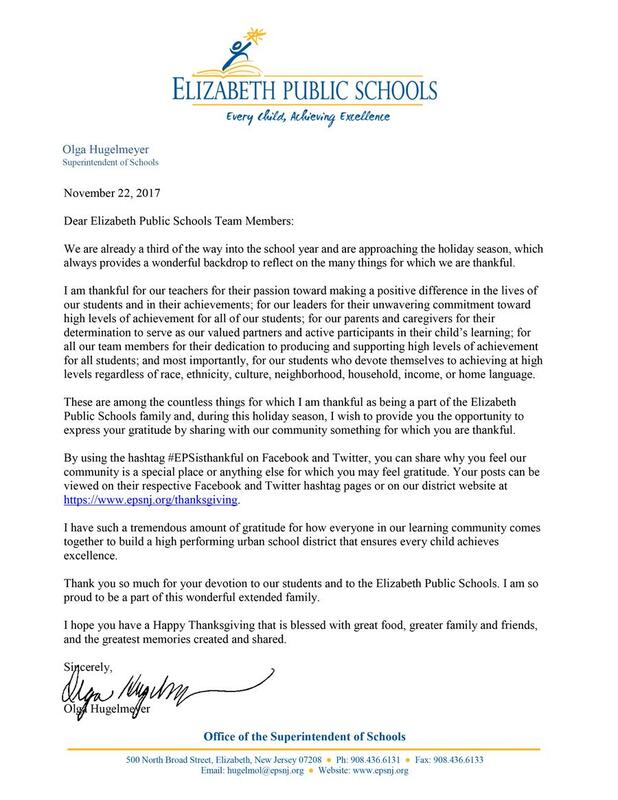 Ward, “Thank You” by Kerry Stubbs, and “This Little Light of Mine” by Traditional Folk and the Board celebrated and recognized excellent achievements of members of the Elizabeth Public Schools Professional Learning Community. Elizabeth Public Schools hosted a two-session New York Jets PLAY 60 program kickoff event for nearly 4,000 students at the Dunn Sports Center on Wednesday, October 18. Estuary Day is an annual daylong event that involves hundreds of science students from area schools and the mentorship from various participants from the City of Elizabeth, Federal and State agencies, and environmental organization. The event's focus is about the importance of the estuary, environment, and science education. 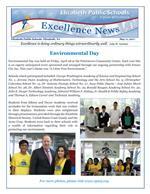 Preschool students of George Washington Academy of Science and Engineering School No. 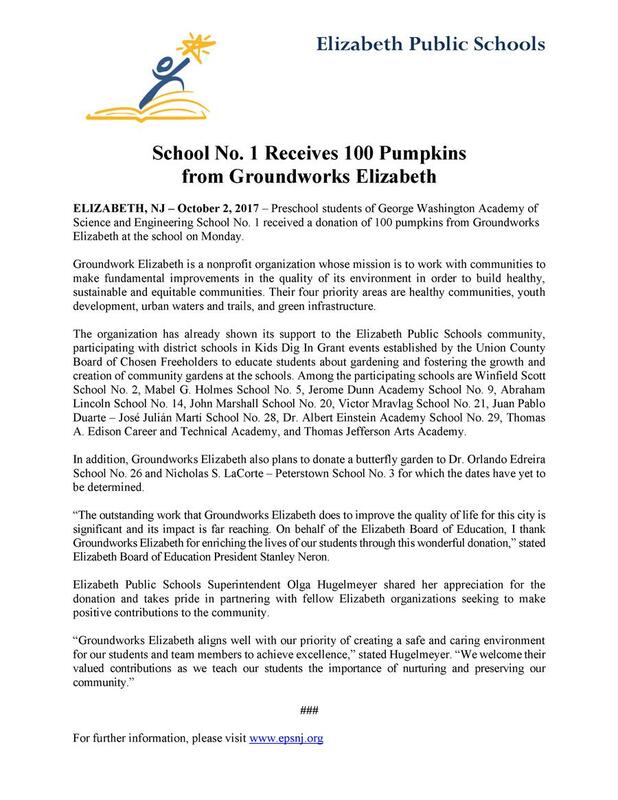 1 received a donation of 100 pumpkins from Groundworks Elizabeth at the school on Monday. 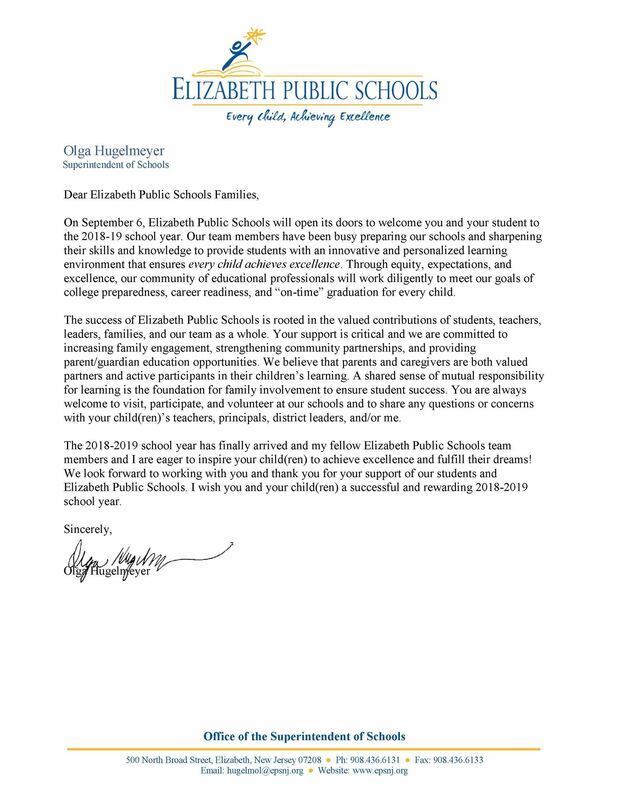 On September 7, 2017, Elizabeth Public Schools opened its doors to students to begin the 2017-2018 school year as it continues on its journey to become one of the highest performing urban school districts in the nation. The Union County Sheriff’s Office held its annual youth academy this August. This is a FREE program that is designed to provide the youths in our communities the opportunity to gain insight into the everyday functions and training of the variety of law enforcement agencies and emergency services in our government. On August 24, 2017, the staff, students, and families of Mabel G. Holmes Annex 5B joined Union County Freeholder, Sergio Granados, Elizabeth Public Schools Commissioner Jose Rodriguez, Buildings and Grounds Coordinator Nino Arcieri, and Union County representatives of the Groundwork of Elizabeth as they made vegetable donations from our Huskies Wonderland Garden from the grant they received from Union County Groundwork to Jan Lilian the CEO of YWCA of Union County in Elizabeth. 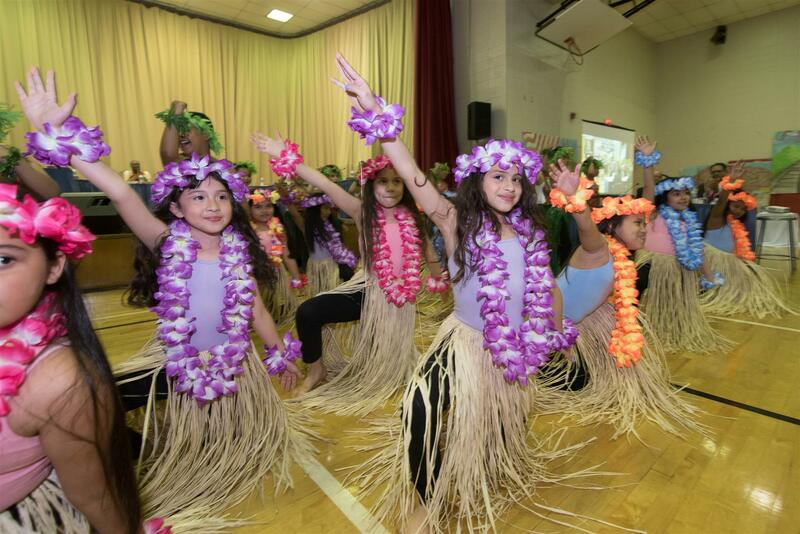 The EPS Summer Arts Program this year went 'Under the Sea' for their theme and final performances held on Monday, July 21, 2017. This year the students were hosted by Victor Mravlag School #21. Once upon a time, there were three fourth grade classes at Elmora School 12 who were filled with magic, creativity and imagination. After studying fairy tales, learning razzle dazzle vocabulary, and wishing upon stars they decided to present a magical fairy tale PBL performance. Cinderella and Prince Charming discussed the essential questions, the life lessons learned and charmed their way into everyone’s hearts. 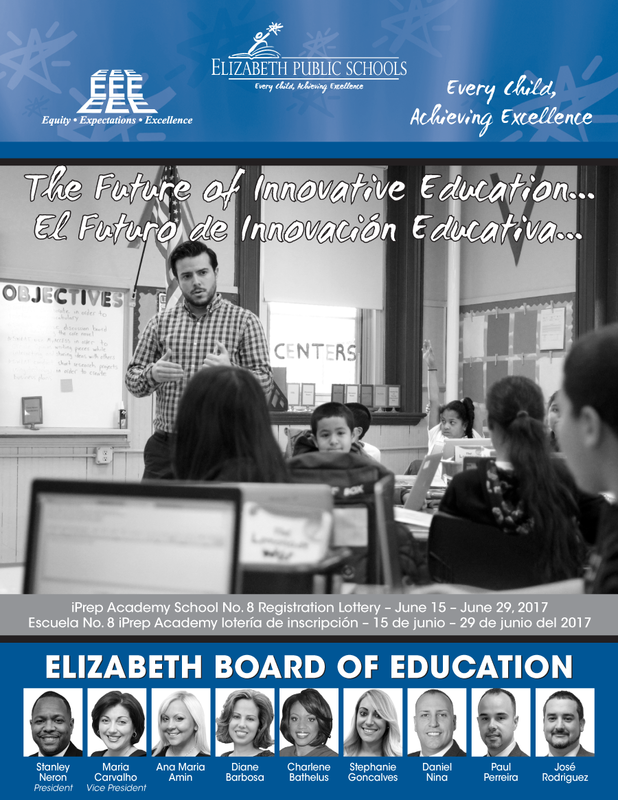 At the Elizabeth Board of Education meeting of June 15 at Nicholas S. LaCorte School No. 3, the evening began with musical performances by students of School No. 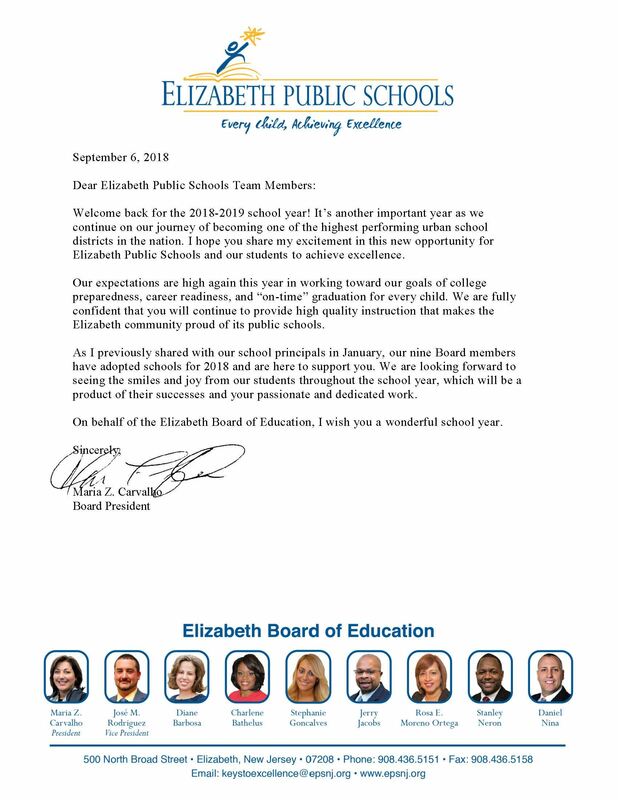 3 and the Board celebrated and recognized excellent achievements of members of the Elizabeth Public Schools Professional Learning Community. 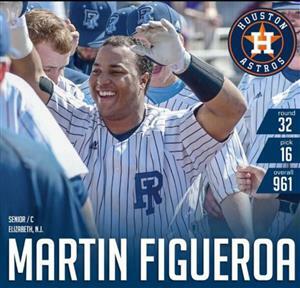 Martin (Tavares) Figueroa, a former member of the Elizabeth Athletics baseball team (Class of 2013), was selected with the 16th pick of the 32nd round (No. 961 overall) by the Houston Astros in the 2017 Major League Baseball Draft. 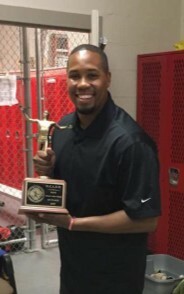 Figueora was a four-year contributor at Elizabeth, earning All-County and All-Group honors during his high school playing career. During his breakout junior campaign in 2012, Figueora hit .420 with 4 home runs, 22 RBI, and 18 runs scored. 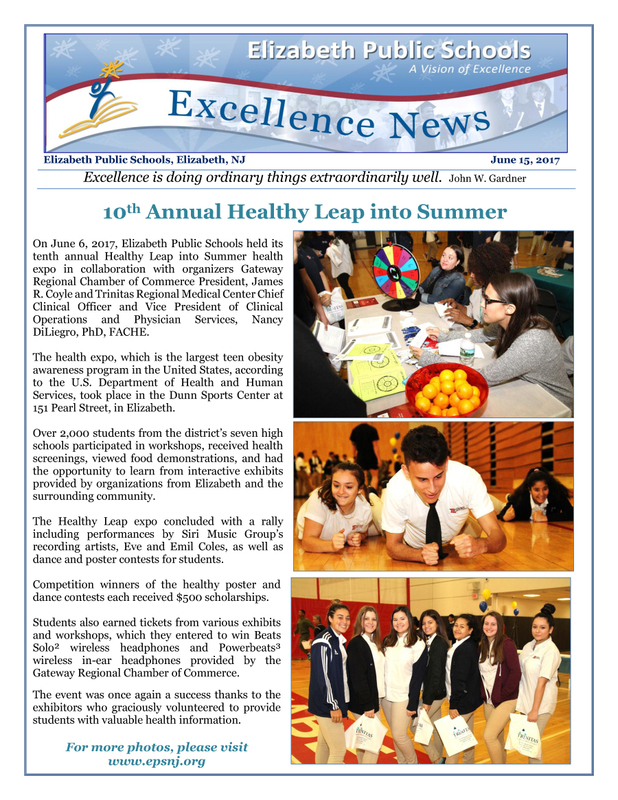 On June 6, 2017, Elizabeth Public Schools held its tenth annual Healthy Leap into Summer health expo in collaboration with organizers Gateway Regional Chamber of Commerce President, James R. Coyle and Trinitas Regional Medical Center Chief Clinical Officer and Vice President of Clinical Operations and Physician Services, Nancy DiLiegro, PhD, FACHE. 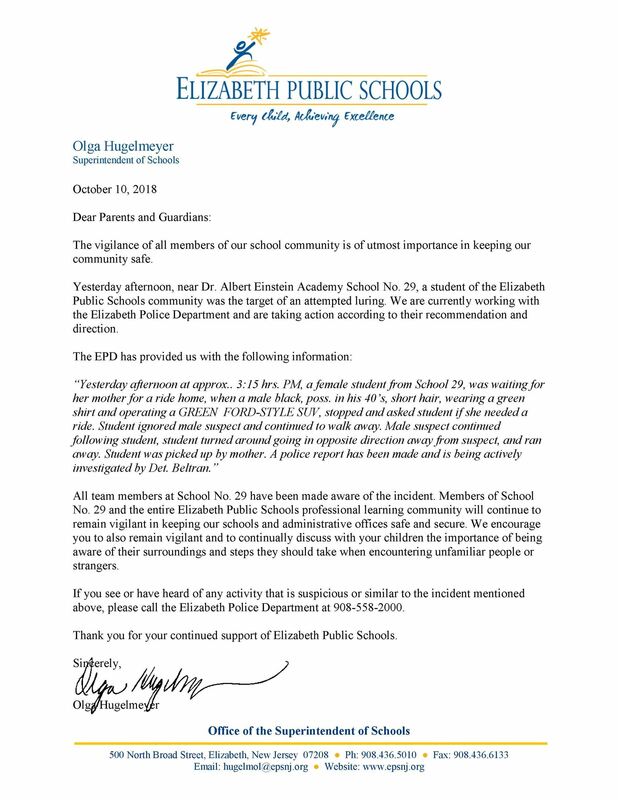 Approximately 2,000 students from throughout Elizabeth Public Schools attended morning and afternoon Law Enforcement Against Drugs (L.E.A.D.) Class of 2017 graduation ceremonies at the Dunn Sports Center. The Historical Society of Elizabeth conducted a forum on May 24th in the Elizabeth Public Library. The topic of the forum was Elizabeth in both 1917 and 2017 with the goal of comparing what life was like during these two periods of time. The 14th annual Tour De Elizabeth took place on Sunday, May 21, 2017 with the theme of “Sounds of Our City”. Several hundred cyclists participated in the 15-mile ride which included two seven-and-a-half mile loops that started and ended at City Hall. 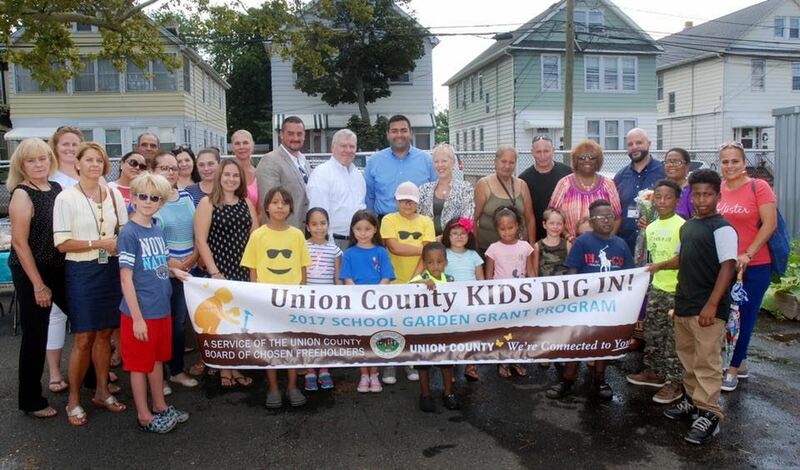 Several schools of Elizabeth Public Schools were chosen to participate in the new “Union County Kids Dig In” garden grant sponsored by the Union County Chosen Board of Freeholders. Schools with students in grades pre-K through 12 are eligible to apply for a Union County Kids Dig In grant, which is funded through the Union County Open Space, Recreation and Historic Preservation Trust Fund. 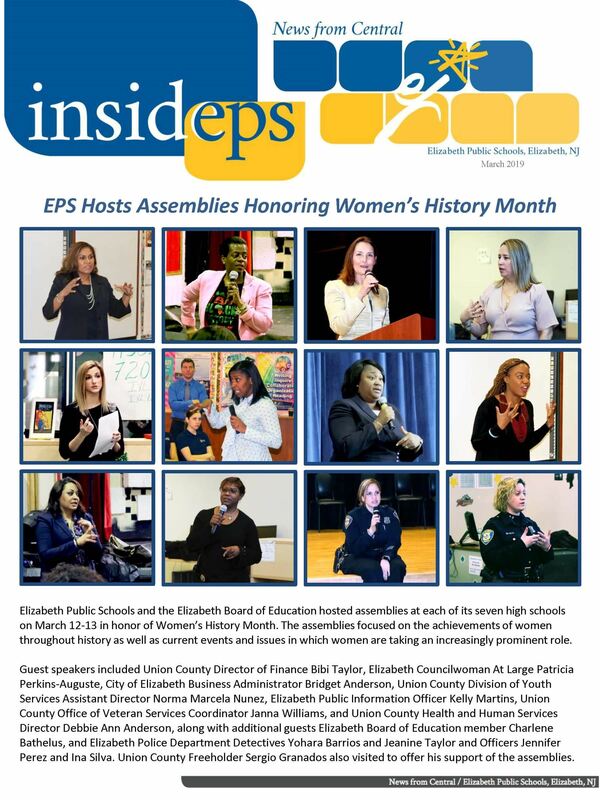 On behalf of Elizabeth Public Schools, I would like to thank the Union County Office of Education and the Union County Board of Chosen Freeholders and Kean University for recognizing the Teachers of the Year at each of our respective PK-12 schools as well as the Union County Superintendent’s Roundtable for sponsoring the Union County Teacher Recognition Program. Boys Varsity Spring Track Team were crowned Union County Champions on Friday! It came down to the last event and they were able to squeak past Union Catholic by 1 point to win 100 pts to 99 pts. 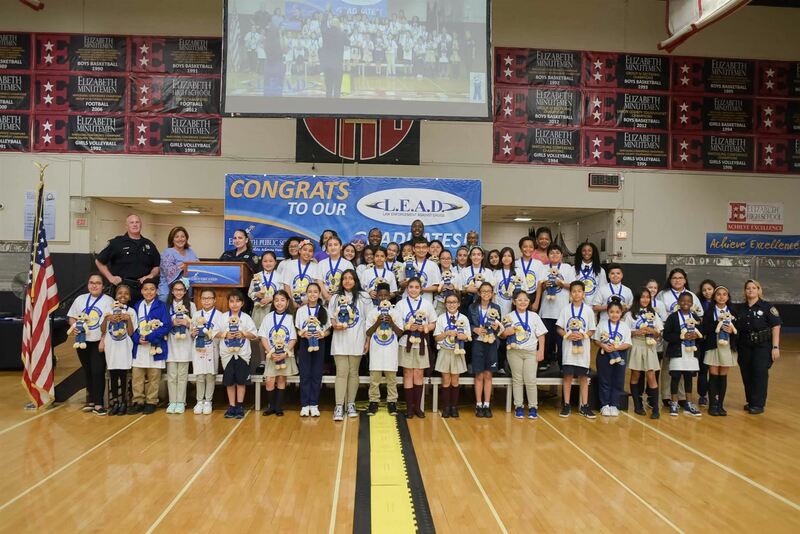 Congratulations to the students at Thomas Jefferson Arts Academy who won first place at the NJ TI:ME Student Music Tech Expo North, sponsored by New Jersey Music Educators Association, at Rutgers University! 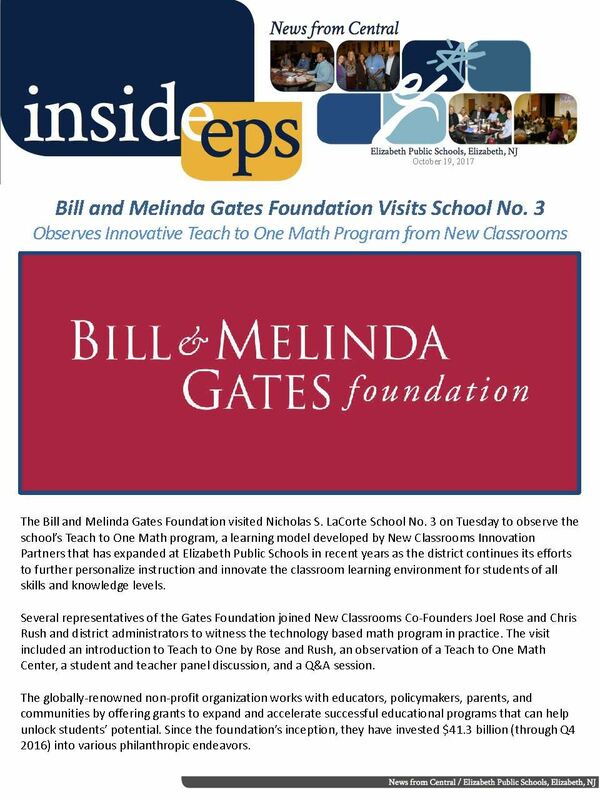 Elizabeth Board of Education President Stanley Neron visited Nicholas S. LaCorte - Peterstown School No. 3, Elmora School No. 12, William F. Halloran School No. 22 @ Monsignor João S. Antão School No. 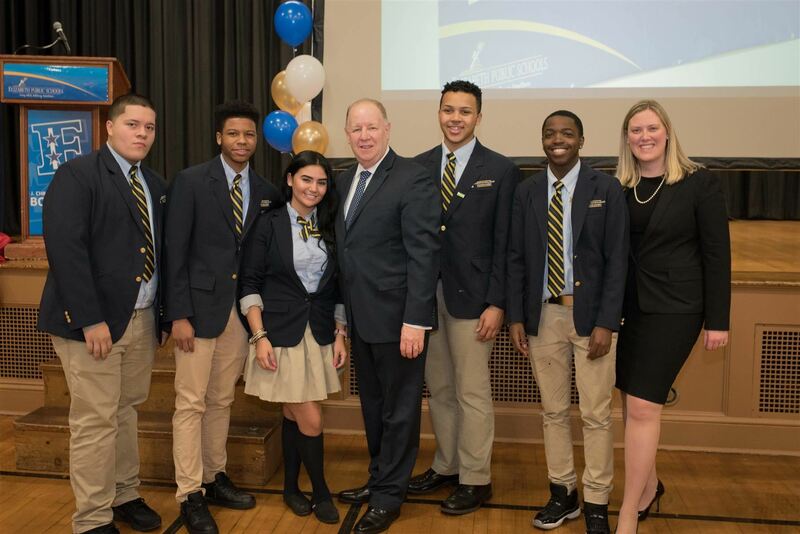 31, Alexander Hamilton Preparatory Academy, and Thomas A. Edison Career and Technical Academy during Week 5 of “We Believe – The President’s Tour”. Mr. Neron enjoyed meeting with students and team members at each respective school; sharing his message of believing in yourself, achieving greatness, and doing the unthinkable; and observing the high quality educational activities taking place. The evening included performances honoring Cuban heritage by students from School No. 27 and Juan Pablo Duarte – José Julián Martí School No. 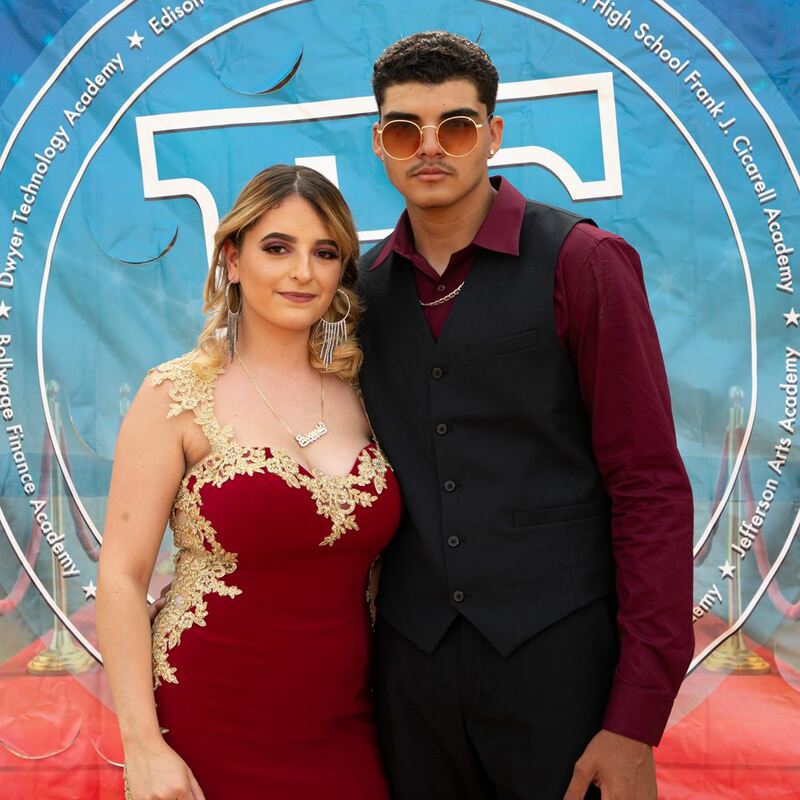 28, a performance honoring Portuguese heritage by the Rancho Portuguese Instructive Social Club, and performances honoring Haitian heritage by Board President Stanley Neron and Kinberd Joseph as well as students of Nicholas Murray Butler School No. 23, Board member Charlene Bathelus, and teacher Erna Letemps. Washington Post Ranks EHS No. 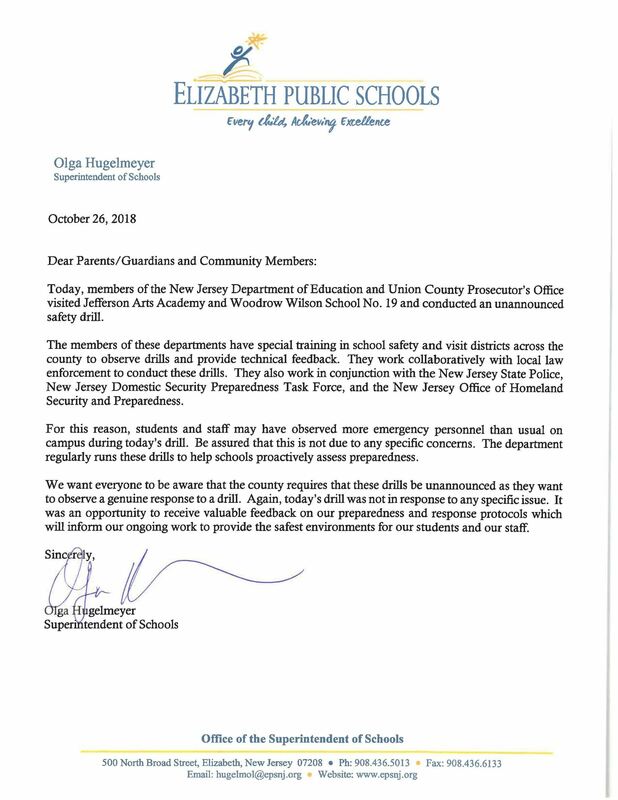 1 in NJ for 4th Straight Year EHS, Hamilton Among Top 300 High Schools in U.S.
Elizabeth High School was named the No. 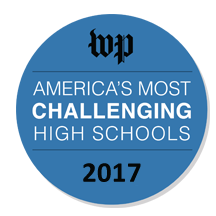 1 most challenging high school in New Jersey for the fourth consecutive year in the newly released report of America’s Most Challenging High Schools by The Washington Post. 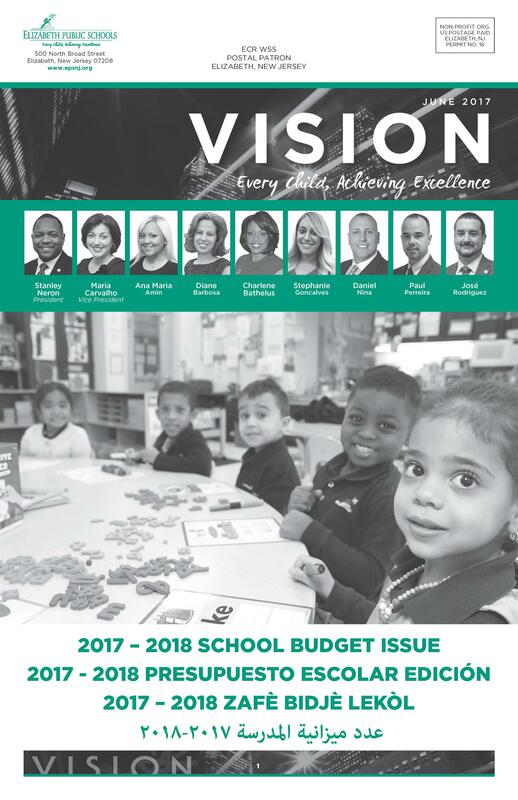 Academy of Finance (AOF) was one of over 100 academies in the NAF Network to reach Model level on NAF’s annual assessment for delivering high quality educational experiences to its students. Students, staff members, and families of Nicholas Murray Butler School No. 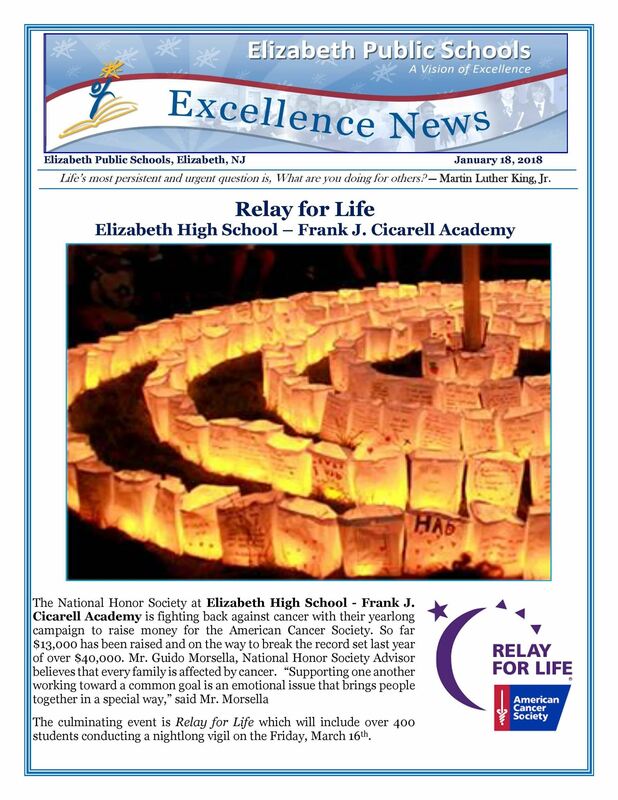 23 raised $2,668.54 throughout March and April for the Leukemia and Lymphoma Society (LLS) during its Pennies for Patients campaign. 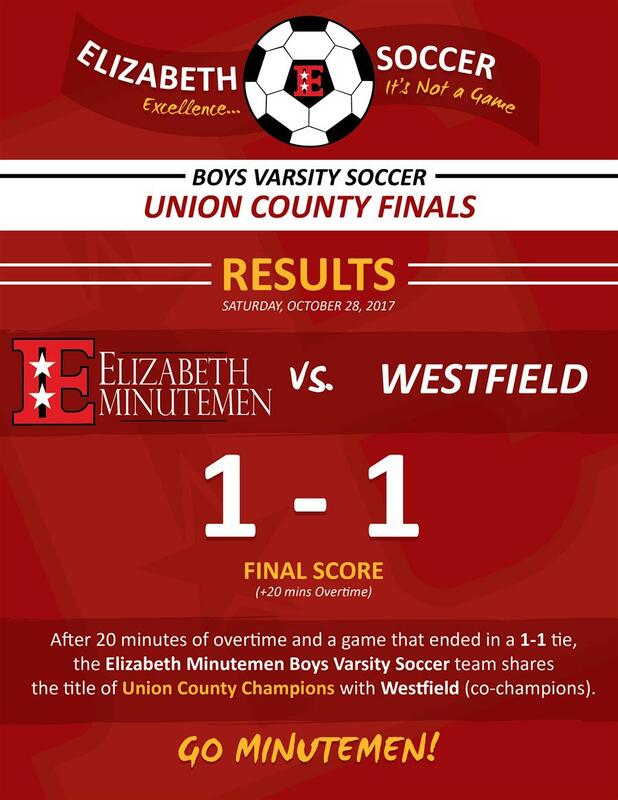 Our Minutemen continued to set records after bringing us a state title in 2012, and moving on to Temple University. Walker threw for 3,295 yards and 22 touchdowns for the Owls last season. He's the all-time winningest quarterback in Temple history. Thomas had a nose for the end zone with 19 total touchdowns. He rushed for 953 yards and caught 33 passes for 418 yards. 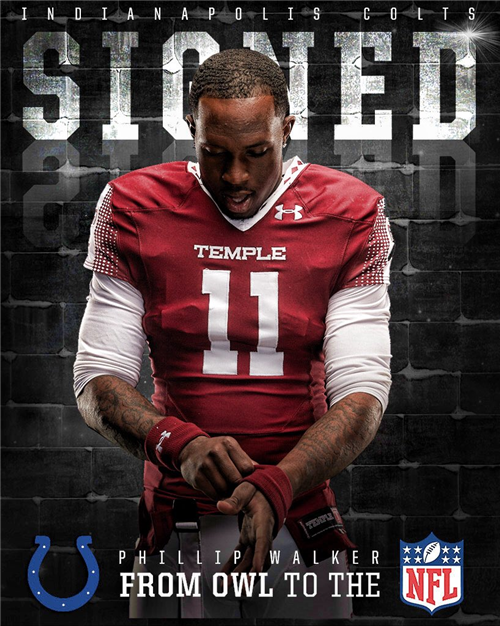 They are 2 of 9 players from Temple to sign NFL contracts!!! The Union County Board of Chosen Freeholders donated a dogwood tree to Alexander Hamilton Preparatory Academy. Ms. Charlene Bathelus, Elizabeth Board of Education Commissioner, graced the ceremony with her august presence. She spoke of the importance of each person infusing positivity into the tree planting ceremony and emphasized the significance of planting trees in local environments. 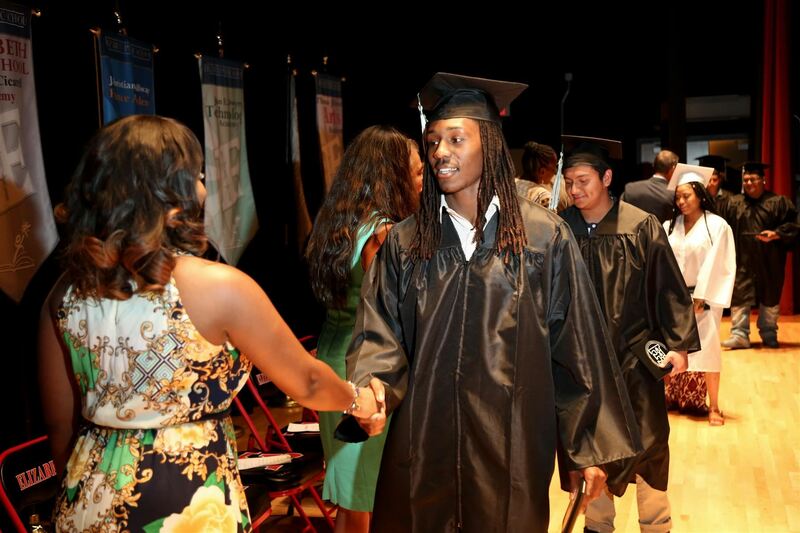 Dodley Thermitus is currently a senior at Thomas A. Edison Technical Academy. 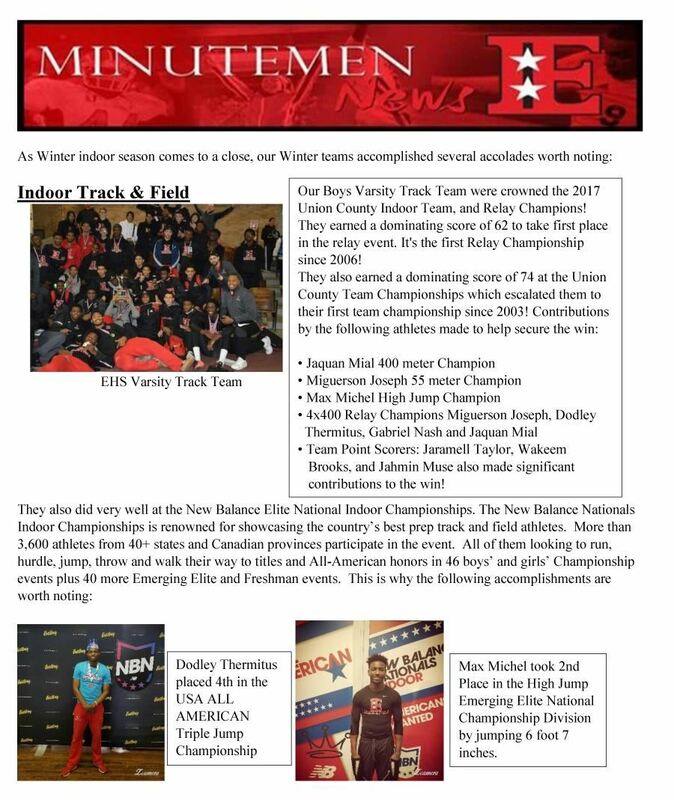 During the past 3 ½ years Dodley has been a major contributor to the Minutemen Track Program. Accolades worth noting are his USA All American status, 4th place finish in the New Balance USA All American Triple Jump Championships, NJSIAA Section 2 Group 4 First Team All-State, Union County First Team All-Conference, 2016 Spring Meet of Champions Triple Jump Champion, Personal Bests: Triple Jump (in) - 49-5.25, Triple Jump - 50-3.25. Both jumps are 2nd best in NJ history. Dodley signed a Letter of Intent to attend the University of Houston in the Fall, where he will be trained by one of the best Olympians from the NJ, Carl Lewis! He is a phenomenal athlete, and we look forward to watching him perform during the Spring season! The Boys Soccer Program is extremely happy and proud to announce that two of their student/athletes have been accepted to Bloomfield College, Division II school. Kevin Patino from Alexander Hamilton Preparatory Academy played 4 years in the varsity squad scoring a total of 44 goals as a forward including the winning goal at the State Sectional Final game in 2015. 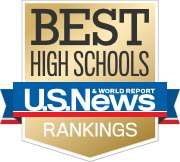 Elizabeth High School (EHS) and Alexander Hamilton Preparatory Academy ranked among the top high schools from throughout the United States as part of the 2017 U.S. News & World Report Best High Schools rankings. Top Ranking Juniors visit Princeton University! 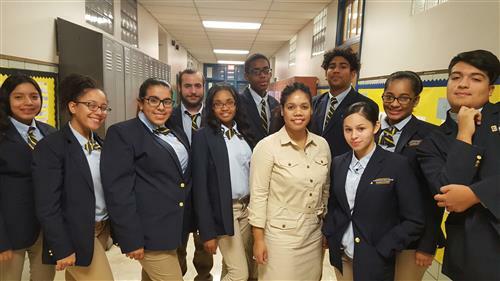 Twenty 11th grade students from Alexander Hamilton Preparatory academy and Elizabeth High Schools visited the campus and received valuable information regarding the undergraduate admissions process. 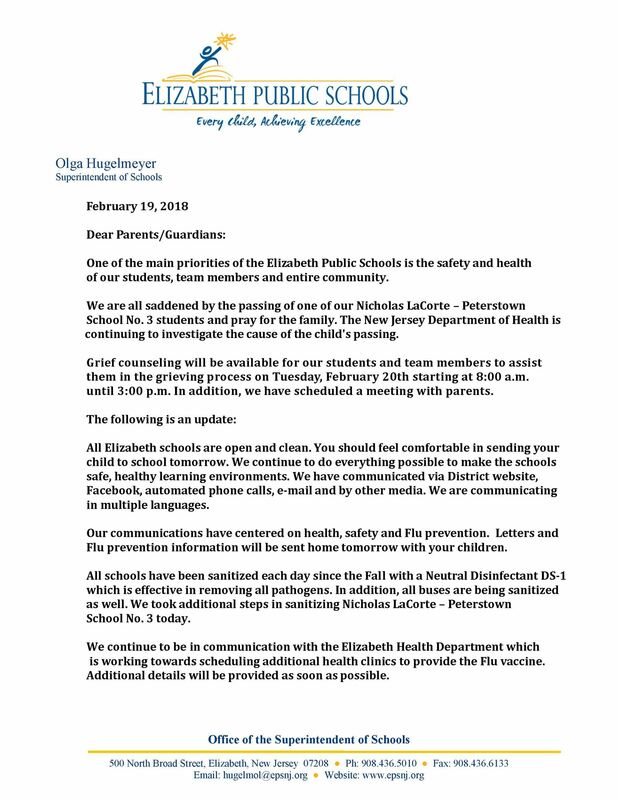 Yesterday, late afternoon, shortly before 5 p.m., Michael Da'shon Eargle, a young man of 28 years who attended Elizabeth Public Schools lost his life at the hands of gun violence. 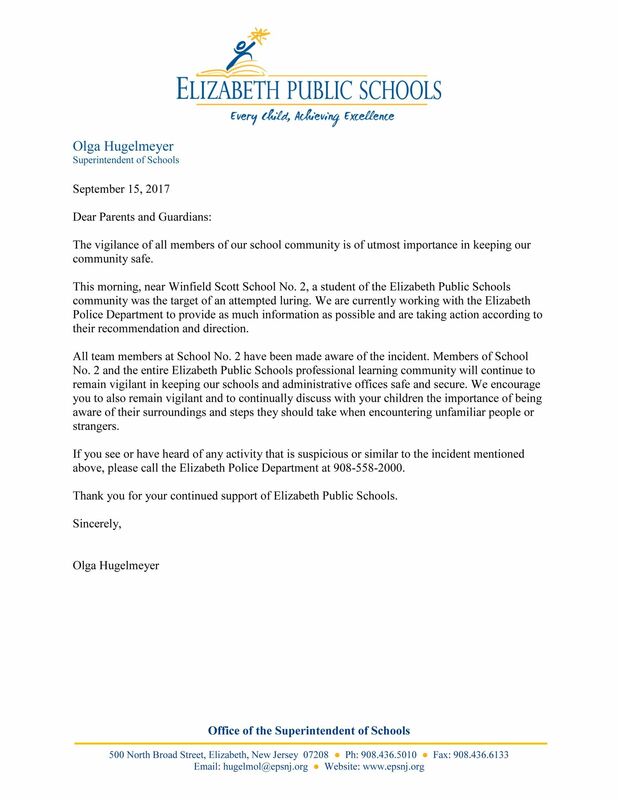 This senseless act of violence happened in broad daylight, at a time when children from our schools were walking home. 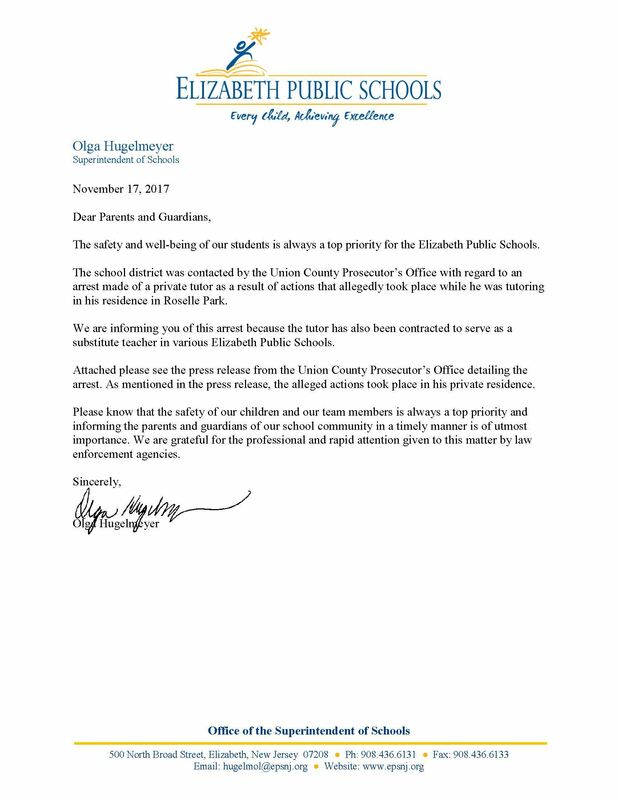 Our children and our community members are not expendable. How many young lives do we have to lose to recognize our conflicts can be resolved with the voice of reason before responding with the hands of violence? 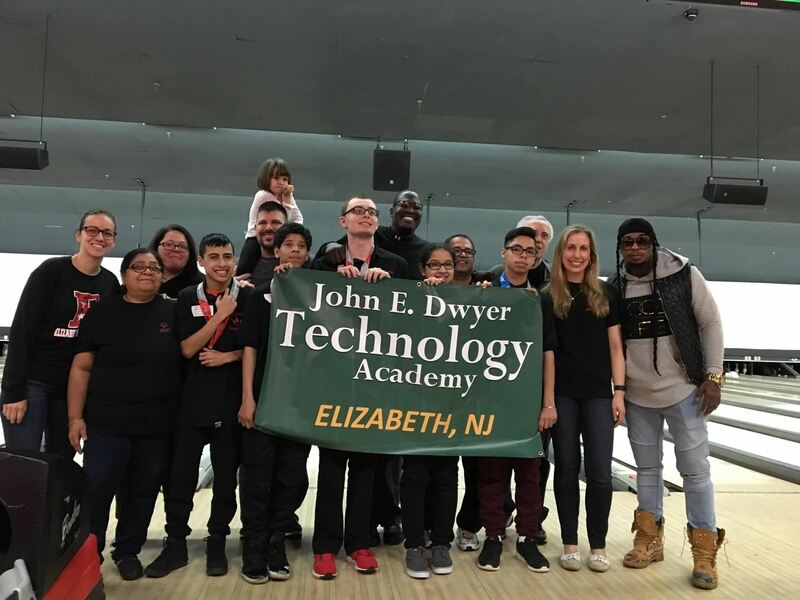 The annual Junior Seminar event was held this past Saturday, April 8th at John E. Dwyer Academy which was open to all 11th grade students in the district. 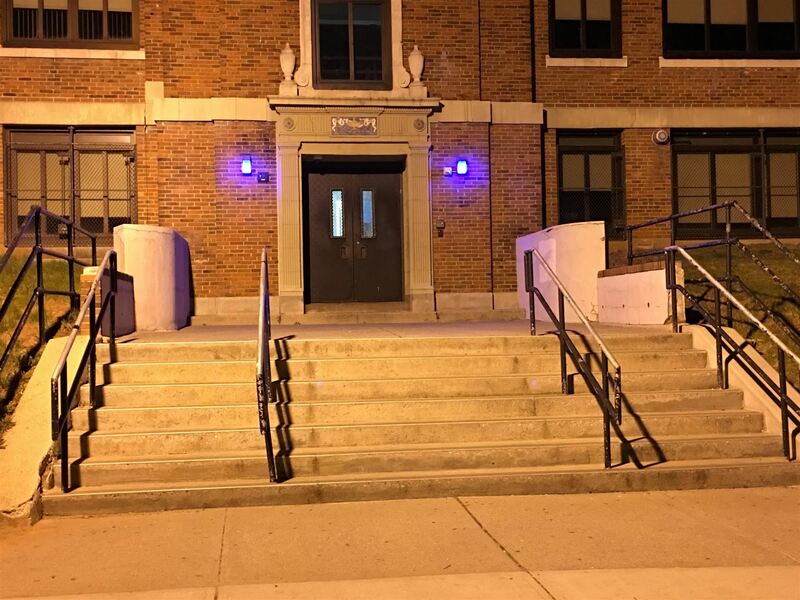 For the second consecutive year, Elizabeth Public Schools is participating in the Autism Speaks “Light It Up Blue” campaign in observance of World Autism Month. Members of the SkillsUSA chapter at the Thomas Edison Career and Technical Academy recently hosted its 4th Annual Luncheon for Veterans. The luncheon, which took place in the Edison Career & Technical Academy’s Tea Room, was held in honor of the veterans housed at Veteran’s Memorial Home at Menlo Park in Edison, New Jersey. Members of SkillsUSA Champions at Work from Thomas A. Edison Career and Technical Academy, with the support of Kansas City Chiefs linebacker and Elizabeth native Khaseem Greene, held a “Day of Unity” for members of the local community at the Fred Erxleben Recreation Center located at Richmond Street in Elizabeth.